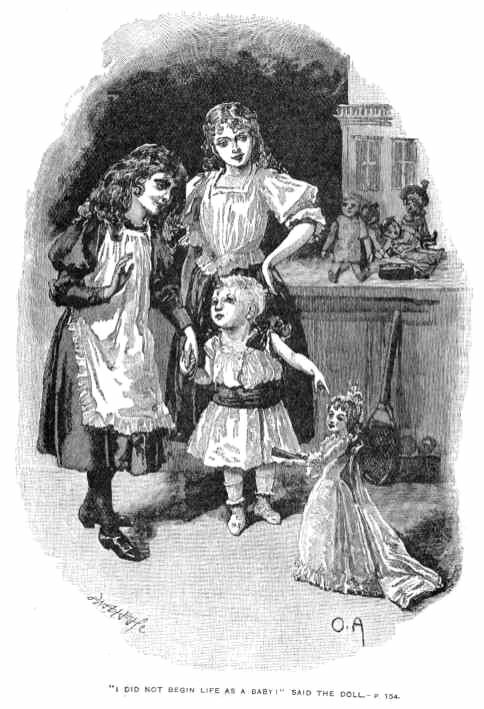 "LITTLE LORD FAUNTLEROY," "SARA CREWE," "EDITHA'S BURGLAR,"
ILLUSTRATED BY R. B. BIRCH, ALFRED BRENNAN, AND O. A. 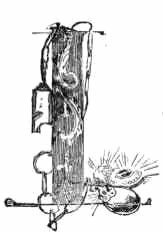 FROM DRAWINGS BY R. B. BIRCH, ALFRED BRENNAN, AND O. A. SHE had not been brought up in America at all. She had been born in France, in a beautiful château, and she had been born heiress to a real fortune, but, nevertheless, just now she felt as if she was very poor, indeed. And yet her home was in one of the most splendid houses in New York. She had a lovely suite of apartments of her own, though she was only eleven years old. 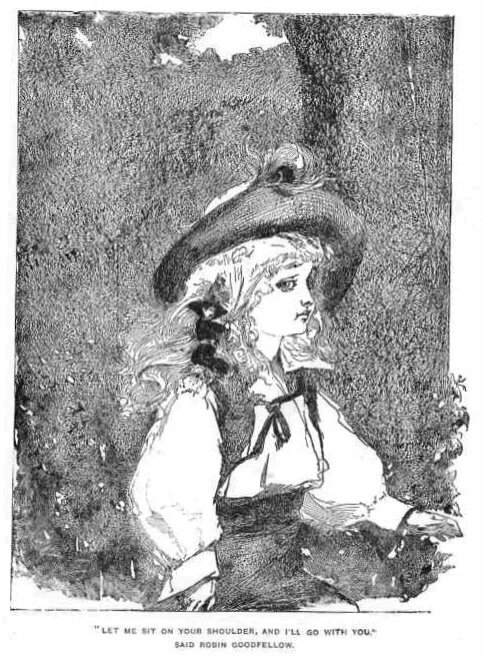 She had her own carriage and a saddle horse, a train of masters, and governesses, and servants, and was regarded by all the children of the neighbourhood as a sort of grand and mysterious little princess, whose incomings and outgoings were to be watched with the greatest interest. "There she is," they would cry, flying to their windows to look at her. "She is going out in her carriage." "She is dressed all in black velvet and splendid fur." "That is her own, own, carriage." "She has millions of money; and she can have anything she wants–Jane says so!" "She is very pretty, too; but she is so pale and has such big, sorrowful, black eyes. I should not be sorrowful if I were in her place; but Jane says the servants say she is always quiet and looks sad." "Her maid says she lived with her aunt, and her aunt made her too religious." She rarely lifted her large dark eyes to look at them with any curiosity. She was not accustomed to the society of children. She had never had a child companion in her life, and these little Americans, who were so very rosy and gay, and who went out to walk or drive with groups of brothers and sisters, and even ran in the street, laughing and playing and squabbling healthily–these children amazed her. Poor little Saint Elizabeth! She had not lived a very natural or healthy life herself, and she knew absolutely nothing of real childish pleasures. You see, it had occurred in this way. When she was a baby of two years her young father and mother died, within a week of each other, of a terrible fever, and the only near relatives the little one had were her Aunt Clotilde and Uncle Bertrand. Her Aunt Clotilde lived in Normandy–her Uncle Bertrand in New York. As these two were her only guardians, and as Bertrand de Rochemont was a gay bachelor, fond of pleasure and knowing nothing of babies, it was natural that he should be very willing that his elder sister should undertake the rearing and education of the child. "Only," he wrote to Mademoiselle de Rochemont, "don't end by training her for an abbess, my dear Clotilde." There was a very great difference between these two people–the distance between the grey stone château in Normandy and the brown stone mansion in New York was not nearly so great as the distance and difference between the two lives. And yet it was said that in her first youth Mademoiselle de Rochemont had been as gay and fond of pleasure as either of her brothers. And then, when her life was at its brightest and gayest–when she was a beautiful and brilliant young woman–she had had a great and bitter sorrow, which had changed her for ever. From that time she had never left the house in which she had been born, and had lived the life of a nun in everything but being inclosed in convent walls. 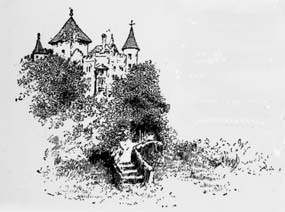 At first she had had her parents to take care of, but when they died she had been left entirely alone in the great château, and devoted herself to prayer and works of charity among the villagers and country people. "Ah! she is good–she is a saint Mademoiselle," the poor people always said when speaking of her; but they also always looked a little awe-stricken when she appeared, and never were very sorry when she left them. She was a tall woman, with a pale, rigid, handsome face, which never smiled. She did nothing but good deeds, but, however grateful her pensioners might be, nobody would ever have dared to dream of loving her. She was just and cold and severe. She wore always a straight black serge gown, broad bands of white linen, and a rosary and crucifix at her waist. She read nothing but religious works and legends of the saints and martyrs, and adjoining her private apartments was a little stone chapel, where the servants said she used to kneel on the cold floor before the altar and pray for hours in the middle of the night. The little curé of the village, who was plump and comfortable, and who had the kindest heart and the most cheerful soul in the world, used to remonstrate with her, always in a roundabout way, however, never quite as if he were referring directly to herself. "One must not let one's self become the stone image of goodness," he said once. "Since one is really of flesh and blood, and lives among flesh and blood, that is not best. No, no; it is not best." But Mademoiselle de Rochemont never seemed exactly of flesh and blood–she was more like a marble female saint who had descended from her pedestal to walk upon the earth. And she did not change, even when the baby Elizabeth was brought to her. She attended strictly to the child's comfort and prayed many prayers for her innocent soul, but it can be scarcely said that her manner was any softer or that she smiled more. At first Elizabeth used to scream at the sight of the black, nun-like dress and the rigid, handsome face, but in course of time she became accustomed to them, and, through living in an atmosphere so silent and without brightness, a few months changed her from a laughing, romping baby into a pale, quiet child, who rarely made any childish noise at all. In this quiet way she became fond of her aunt. She saw little of anyone but the servants, who were all trained to quietness also. As soon as she was old enough her aunt began her religious training. Before she could speak plainly she heard legends of saints and stories of martyrs. She was taken into the little chapel and taught to pray there. She believed in miracles, and would not have been surprised at any moment if she had met the Child Jesus or the Virgin in the beautiful rambling gardens which surrounded the château. She was a sensitive, imaginative child, and the sacred romances she heard filled all her mind and made up her little life. She wished to be a saint herself, and spent hours in wandering in the terraced rose gardens wondering if such a thing was possible in modern days, and what she must do to obtain such holy victory. Her chief sorrow was that she knew herself to be delicate and very timid–so timid that she often suffered when people did not suspect it–and she was afraid that she was not brave enough to be a martyr. Once, poor little one! when she was alone in her room, she held her hand over a burning wax candle, but the pain was so terrible that she could not keep it there. Indeed, she fell back white and faint, and sank upon her chair, breathless and in tears, because she felt sure that she could not chant holy songs if she were being burned at the stake. She had been vowed to the Virgin in her babyhood, and was always dressed in white and blue, but her little dress was a small conventual robe, straight and narrow cut, of white woollen stuff, and banded plainly with blue at the waist. She did not look like other children, but she was very sweet and gentle, and her pure little pale face and large, dark eyes had a lovely dreamy look. 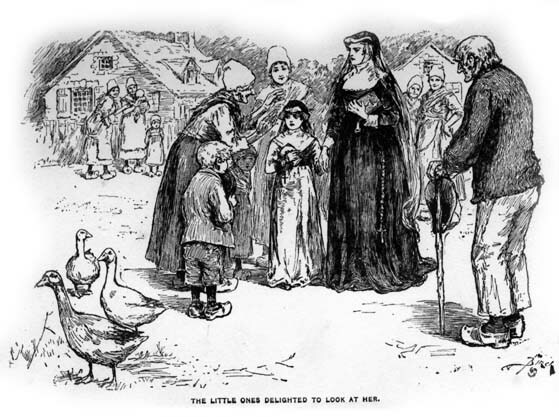 When she was old enough to visit the poor with her Aunt Clotilde–and she was hardly seven years old when it was considered proper that she should begin–the villagers did not stand in awe of her. They began to adore her, almost to worship her, as if she had, indeed, been a sacred child. The little ones delighted to look at her, to draw near her sometimes and touch her soft white and blue robe. And, when they did so, she always returned their looks with such a tender, sympathetic smile, and spoke to them in so gentle a voice, that they were in ecstasies. They used to talk her over, tell stories about her when they were playing together afterwards. "The little Mademoiselle," they said, "she is a child saint. I have heard them say so. Sometimes there is a little light round her head. One day her little white robe will begin to shine too, and her long sleeves will be wings, and she will spread them and ascend through the blue sky to Paradise. You will see if it is not so." So, in this secluded world in the grey old château, with no companion but her aunt, with no occupation but her studies and her charities, with no thoughts but those of saints and religious exercises, Elizabeth lived until she was eleven years old. Then a great grief befell her. One morning, Mademoiselle de Rochemont did not leave her room at the regular hour. As she never broke a rule she had made for herself and her household, this occasioned great wonder. Her old maid servant waited half an hour–went to her door, and took the liberty of listening to hear if she was up and moving about her room. There was no sound. Old Alice returned, looking quite agitated. "Would Mademoiselle Elizabeth mind entering to see if all was well? Mademoiselle her aunt might be in the chapel." Elizabeth went. Her aunt was not in her room. Then she must be in the chapel. The child entered the sacred little place. The morning sun was streaming in through the stained-glass windows above the altar–a broad ray of mingled brilliant colours slanted to the stone floor and warmly touched a dark figure lying there. 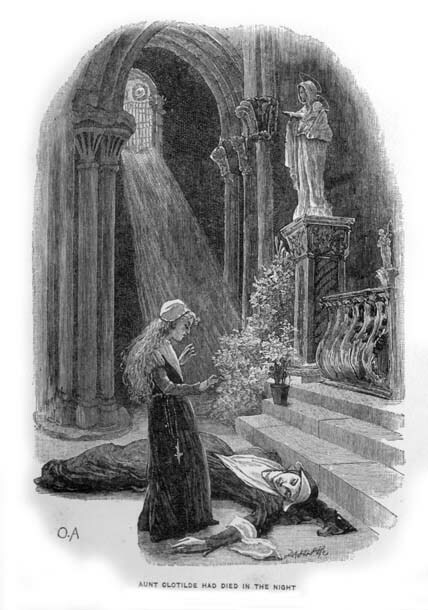 It was Aunt Clotilde, who had sunk forward while kneeling at prayer and had died in the night. That was what the doctors said when they were sent for. She had been dead some hours–she had died of disease of the heart, and apparently without any pain or knowledge of the change coming to her. Her face was serene and beautiful, and the rigid look had melted away. Someone said she looked like little Mademoiselle Elizabeth; and her old servant Alice wept very much, and said, "yes–yes–it was so when she was young, before her unhappiness came. She had the same beautiful little face, but she was more gay, more of the world. Yes, they were much alike then." Less than two months from that time Elizabeth was living in the home of her Uncle Bertrand, in New York. He had come to Normandy for her himself, and taken her back with him across the Atlantic. She was richer than ever now, as a great deal of her Aunt Clotilde's money had been left to her, and Uncle Bertrand was her guardian. He was a handsome, elegant, clever man, who, having lived long in America and being fond of American life, did not appear very much like a Frenchman–at least he did not appear so to Elizabeth, who had only seen the curé and the doctor of the village. Secretly he was very much embarrassed at the prospect of taking care of a little girl, but family pride, and the fact that such a very little girl, who was also such a very great heiress, must be taken care of sustained him. But when he first saw Elizabeth he could not restrain an exclamation of consternation. "But, my dear child," exclaimed Uncle Bertrand, staring at her aghast. He managed to recover himself very quickly, and was, in his way, very kind to her; but the first thing he did was to send to Paris for a fashionable maid and fashionable mourning "Because, as you will see," he remarked to Alice, "we cannot travel as we are. It is a costume for a convent or the stage." Before she took off her little conventual robe, Elizabeth went to the village to visit all her poor. The curé went with her and shed tears himself when the people wept and kissed her little hand. When the child returned, she went into the chapel and remained there alone for a long time. She felt as if she was living in a dream when all the old life was left behind and she found herself in the big, luxurious house in the gay New York street. Nothing that could be done for her comfort had been left undone. She had several beautiful rooms, a wonderful governess, different masters to teach her, her own retinue of servants as, indeed, has been already said. But, secretly, she felt bewildered and almost terrified, everything was so new, so strange, so noisy, and so brilliant. The dress she wore made her feel unlike herself; the books they gave her were full of pictures and stories of worldly things of which she knew nothing. Her carriage was brought to the door and she went out with her governess, driving round and round the park with scores of other people who looked at her curiously, she did not know why. The truth was that her refined little face was very beautiful indeed, and her soft dark eyes still wore the dreamy spiritual look which made her unlike the rest of the world. "She looks like a little princess," she heard her uncle say one day. "She will be some day a beautiful, an enchanting woman–her mother was so when she died at twenty, but she had been brought up differently. This one is a little devotee. I am afraid of her. Her governess tells me she rises in the night to pray." He said it with light laughter to some of his gay friends by whom he had wished the child to be seen. He did not know that his gaiety filled her with fear and pain. She had been taught to believe gaiety worldly and sinful, and his whole life was filled with it. He had brilliant parties–he did not go to church–he had no pensioners–he seemed to think of nothing but pleasure. Poor little Saint Elizabeth prayed for his soul many an hour when he was asleep after a grand dinner or supper party. He could not possibly have dreamed that there was no one of whom she stood in such dread; her timidity increased tenfold in his presence. When he sent for her and she went into the library to find him luxurious in his arm chair, a novel on his knee, a cigar in his white hand, a tolerant, half cynical smile on his handsome mouth, she could scarcely answer his questions, and could never find courage to tell him what she so earnestly desired. She had found out early that Aunt Clotilde and the curé, and the life they had led, had only aroused in his mind a half-pitying amusement. It seemed to her that he did not understand and had strange sacrilegious thoughts about them–he did not believe in miracles–he smiled when she spoke of saints. How could she tell him that she wished to spend all her money in building churches and giving alms to the poor? That was what she wished to tell him,–that she wanted money to send back to the village, that she wanted it to give to the poor people she saw in the streets, to those who lived in the miserable places. But when she found herself face to face with him and he said some witty thing to her and seemed to find her only amusing, all her courage failed her. Sometimes she thought she would throw herself upon her knees before him and beg him to send her back to Normandy–to let her live alone in the château as her Aunt Clotilde had done. One morning, she arose very early, and knelt a long time before the little altar she had made for herself in her dressing room. It was only a table with some black velvet thrown over it, a crucifix, a saintly image, and some flowers standing upon it. She had put on, when she got up, the quaint black serge robe, because she felt more at home in it, and her heart was full of determination. The night before she had received a letter from the curé and it had contained sad news. A fever had broken out in her beloved village, the vines had done badly, there was sickness among the cattle, there was already beginning to be suffering, and if something were not done for the people they would not know how to face the winter. In the time of Mademoiselle de Rochemont they had always been made comfortable and happy at Christmas. What was to be done? The curé ventured to write to Mademoiselle Elizabeth. The poor child had scarcely slept at all. Her dear village! Her dear people! The children would be hungry; the cows would die; there would be no fires to warm those who were old. "I must go to uncle," she said, pale and trembling. "I must ask him to give me money. I am afraid, but it is right to mortify the spirit. The martyrs went to the stake. The holy Saint Elizabeth was ready to endure anything that she might do her duty and help the poor." Because she had been called Elizabeth she had thought and read a great deal of the saint whose namesake she was–the saintly Elizabeth whose husband was so wicked and cruel, and who wished to prevent her from doing good deeds. And oftenest of all she had read the legend which told that one day as Elizabeth went out with a basket of food to give to the poor and hungry, she had met her savage husband, who had demanded that she should tell him what she was carrying, and when she replied "Roses," and he tore the cover from the basket to see if she spoke the truth, a miracle had been performed, and the basket was filled with roses, so that she had been saved from her husband's cruelty, and also from telling an untruth. To little Elizabeth this legend had been beautiful and quite real–it proved that if one were doing good, the saints would take care of one. 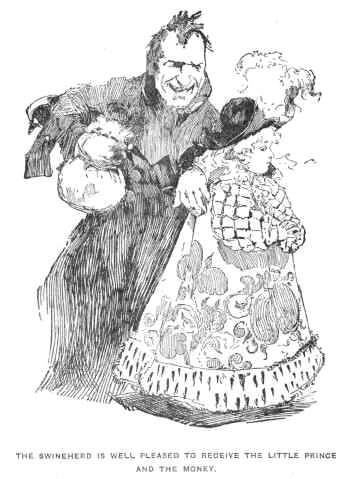 Since she had been in her new home, she had, half consciously, compared her Uncle Bertrand with the wicked Landgrave, though she was too gentle and just to think he was really cruel, as Saint Elizabeth's husband had been, only he did not care for the poor, and loved only the world–and surely that was wicked. She had been taught that to care for the world at all was a fatal sin. She did not eat any breakfast. She thought she would fast until she had done what she intended to do. It had been her Aunt Clotilde's habit to fast very often. She waited anxiously to hear that her Uncle Bertrand had left his room. He always rose late, and this morning, he was later than usual as he had had a long gay dinner party the night before. It was nearly twelve before she heard his door open. Then she went quickly to the staircase. Her heart was beating so fast that she put her little hand to her side and waited a moment to regain her breath. She felt quite cold. "Perhaps I must wait until he has eaten his breakfast," she said. "Perhaps I must not disturb him yet. It would make him displeased. I will wait–yes, for a little while." She did not return to her room, but waited upon the stairs. It seemed to take a long time. It appeared that a friend breakfasted with him. She heard a gentleman come in and recognized his voice, which she had heard before. She did not know what the gentleman's name was, but she had met him going in and out with her uncle once or twice, and had thought he had a kind face and kind eyes. He had looked at her in an interested way when he spoke to her–even as if he were a little curious, and she had wondered why he did so. When the door of the breakfast room opened and shut as the servants went in, she could hear the two laughing and talking. They seemed to be enjoying themselves very much. Once she heard an order given for the mail phaeton. They were evidently going out as soon as the meal was over. At last the door opened and they were coming out. Elizabeth ran down the stairs and stood in a small reception room. Her heart began to beat faster than ever. "The blessed martyrs were not afraid," she whispered to herself. "Uncle Bertrand!" she said, as he approached, and she scarcely knew her own faint voice. "Uncle Bertrand––"
He turned, and seeing her, started, and exclaimed, rather impatiently–evidently he was at once amazed and displeased to see her. He was in a hurry to go out, and the sight of her odd little figure, standing in its straight black robe between the portiéres, the slender hands clasped on the breast, the small pale face and great dark eyes uplifted, was certainly a surprise to him. "Elizabeth!" he said, "what do you wish? Why do you come downstairs? And that impossible dress! Why do you wear it again? It is not suitable." 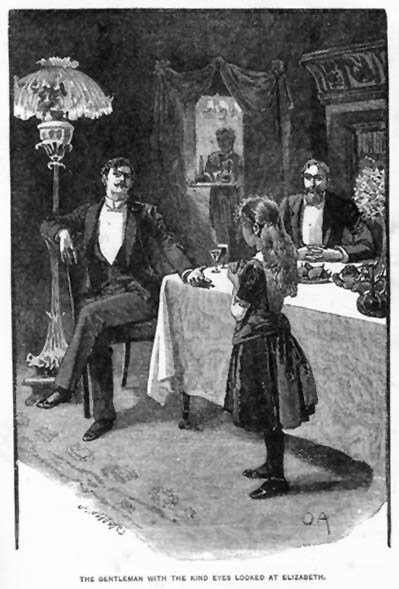 "Uncle Bertrand," said the child, clasping her hands still more tightly, her eyes growing larger in her excitement and terror under his displeasure, "it is that I want money–a great deal. I beg your pardon if I derange you. It is for the poor. Moreover, the curé has written the people of the village are ill–the vineyards did not yield well. They must have money. I must send them some." Uncle Bertrand shrugged his shoulders. "That is the message of monsieur le curé, is it?" he said. "He wants money! My dear Elizabeth, I must inquire further. You have a fortune, but I cannot permit you to throw it away. You are a child, and do not understand—"
"But," cried Elizabeth, trembling with agitation, "they are so poor when one does not help them; their vineyards are so little, and if the year is bad they must starve. Aunt Clotilde gave to them every year–even in the good years. She said they must be cared for like children." "That was your Aunt Clotilde's charity," replied her uncle. "Sometimes she was not so wise as she was devout. I must know more of this. I have no time at present. I am going out of town. In a few days I will reflect upon it. Tell your maid to give that hideous garment away. Go out to drive–amuse yourself–you are too pale." Elizabeth looked at his handsome, careless face in utter helplessness. This was a matter of life and death to her; to him it meant nothing. "But it is winter," she panted, breathlessly; "there is snow. Soon it will be Christmas, and they will have nothing–no candles for the church, no little manger for the holy child, nothing for the poorest ones. And the children—"
"It shall be thought of later," said Uncle Bertrand. "I am too busy now. Be reasonable, my child, and run away. You detain me." He left her with a slight impatient shrug of his shoulders and the slight amused smile on his lips. She heard him speak to his friend. "She was brought up by one who had renounced the world," he said, "and she has already renounced it herself–pauvre petite enfant! At eleven years she wishes to devote her fortune to the poor and herself to the Church." Elizabeth shrank back into the shadow of the portiéres. Great burning tears filled her eyes and slipped down her cheeks, falling upon her breast. "He does not care," she said; "he does not know. And I do no one good–no one." And she covered her face with her hands and stood sobbing all alone. When she returned to her room she was so pale that her maid looked at her anxiously, and spoke of it afterwards to the other servants. They were all fond of Mademoiselle Elizabeth. She was always kind and gentle to everybody. Nearly all the day she sat, poor little saint! by her window looking out at the passers-by in the snowy street. But she scarcely saw the people at all, her thoughts were far away, in the little village where she had always spent her Christmas before. Her Aunt Clotilde had allowed her at such times to do so much. There had not been a house she had not carried some gift to; not a child who had been forgotten. And the church on Christmas morning had been so beautiful with flowers from the hot-houses of the château. It was for the church, indeed, that the conservatories were chiefly kept up. Mademoiselle de Rochemont would scarcely have permitted herself such luxuries. But there would not be flowers this year, the château was closed; there were no longer gardeners at work, the church would be bare and cold, the people would have no gifts, there would be no pleasure in the little peasants' faces. Little Saint Elizabeth wrung her slight hands together in her lap. "Oh," she cried, "what can I do? And then there is the poor here–so many. And I do nothing. The Saints will be angry; they will not intercede for me. I shall be lost!" It was not alone the poor she had left in her village who were a grief to her. As she drove through the streets she saw now and then haggard faces; and when she had questioned a servant who had one day come to her to ask for charity for a poor child at the door, she had found that in parts of this great, bright city, which she had not seen there was said to be cruel want and suffering, as in all great cities. "And it is so cold now," she thought, "with the snow on the ground." The lamps in the street were just beginning to be lighted when her Uncle Bertrand returned. It appeared that he had brought back with him the gentleman with the kind face. They were to dine together, and Uncle Bertrand desired that Mademoiselle Elizabeth should join them. Evidently the journey out of town had been delayed for a day at least. 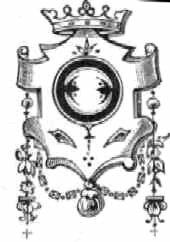 There came also another message: Monsieur de Rochemont wished Mademoiselle to send to him by her maid a certain box of antique ornaments which had been given to her by her Aunt Clotilde. Elizabeth had known less of the value of these jewels than of their beauty. She knew they were beautiful, and that they had belonged to her Aunt Clotilde in the gay days of her triumphs as a beauty and a brilliant and adored young woman, but it seemed that they were also very curious, and Monsieur de Rochemont wished his friend to see them. When Elizabeth went downstairs she found them examining them together. "They must be put somewhere for safe keeping," Uncle Bertrand was saying. "It should have been done before. I will attend to it." The gentleman with the kind eyes looked at Elizabeth with an interested expression as she came into the room Her slender little figure in its black velvet dress, her delicate little face with its large soft sad eyes, the gentle gravity of her manner made her seem quite unlike other children. He did not seem simply to find her amusing, as her Uncle Bertrand did. She was always conscious that behind Uncle Bertrand's most serious expression there was lurking a faint smile as he watched her, but this visitor looked at her in a different way. He was a doctor, she discovered. Dr. Norris, her uncle called him, and Elizabeth wondered if perhaps his profession had not made him quick of sight and kind. She felt that it must be so when she heard him talk at dinner. She found that he did a great deal of work among the very poor–that he had a hospital, where he received little children who were ill–who had perhaps met with accidents, and could not be taken care of in their wretched homes. He spoke most frequently of terrible quarters, which he called Five Points; the greatest poverty and suffering was there. And he spoke of it with such eloquent sympathy, that even Uncle Bertrand began to listen with interest. "Come," he said, "you are a rich, idle fellow, De Rochemont, and we want rich, idle fellows to come and look into all this and do something for us. You must let me take you with me some day." "It would disturb me too much, my good Norris," said Uncle Bertrand, with a slight shudder. "I should not enjoy my dinner after it." "Then go without your dinner," said Dr. Norris. "These people do. You have too many dinners. Give up one." Uncle Bertrand shrugged his shoulders and smiled. "It is Elizabeth who fasts," he said. "Myself, I prefer to dine. And yet, some day, I may have the fancy to visit this place with you." Elizabeth could scarcely have been said to dine this evening. She could not eat. She sat with her large, sad eyes fixed upon Dr. Norris' face as he talked. Every word he uttered sank deep into her heart. The want and suffering of which he spoke were more terrible than anything she had ever heard of–it had been nothing like this in the village. Oh! no, no. As she thought of it there was such a look in her dark eyes as almost startled Dr. Norris several times when he glanced at her, but as he did not know the particulars of her life with her aunt and the strange training she had had, he could not possibly have guessed what was going on in her mind, and how much effect his stories were having. The beautiful little face touched him very much, and the pretty French accent with which the child spoke seemed very musical to him, and added a great charm to the gentle, serious answers she made to the remarks he addressed to her. He could not help seeing that something had made little Mademoiselle Elizabeth a pathetic and singular little creature, and he continually wondered what it was. "Do you think she is a happy child?" he asked Monsieur de Rochemont when they were alone together over their cigars and wine. "Happy?" said Uncle Bertrand, with his light smile. "She has been taught, my friend, that to be happy upon earth is a crime. That was my good sister's creed. One must devote one's self, not to happiness, but entirely to good works. I think I have told you that she, this little one, desires to give all her fortune to the poor. Having heard you this evening, she will wish to bestow it upon your Five Points." 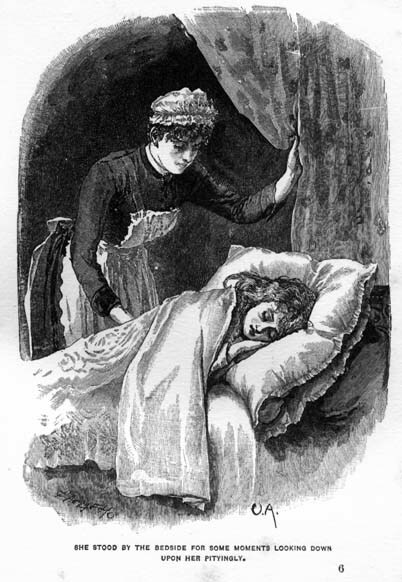 When, having retired from the room with a grave and stately little obeisance to her Uncle and his guest, Elizabeth had gone upstairs, it had not been with the intention of going to bed. She sent her maid away and knelt before her altar for a long time. "The Saints will tell me what to do," she said. "The good Saints, who are always gracious, they will vouchsafe to me some thought which will instruct me if I remain long enough at prayer." She remained at prayer a long time. When at last she arose from her knees it was long past midnight, and she was tired and weak, but the thought had not been given to her. But just as she laid her head upon her pillow it came. The ornaments given to her by her Aunt Clotilde somebody would buy them. They were her own–it would be right to sell them–to what better use could they be put? Was it not what Aunt Clotilde would have desired? Had she not told her stories of the good and charitable who had sold the clothes from their bodies that the miserable might be helped? Yes, it was right. These things must be done. All else was vain and useless and of the world. But it would require courage–great courage. To go out alone to find a place where the people would buy the jewels–perhaps there might be some who would not want them. And then when they were sold to find this poor and unhappy quarter of which her Uncle's guest had spoken, and to give to those who needed–all by herself. Ah! what courage it would require. And then Uncle Bertrand, some day he would ask about the ornaments, and discover all, and his anger might be terrible. No one had ever been angry with her; how could she bear it. But had not the Saints and Martyrs borne everything? had they not gone to the stake and the rack with smiles? She thought of Saint Elizabeth and the cruel Landgrave. It could not be even so bad as that–but whatever the result was it must be borne. So at last she slept, and there was upon her gentle little face so sweetly sad a look that when her maid came to waken her in the morning she stood by the bedside for some moments looking down upon her pityingly. The day seemed very long and sorrowful to the poor child. It was full of anxious thoughts and plannings. She was so innocent and inexperienced, so ignorant of all practical things. She had decided that it would be best to wait until evening before going out, and then to take the jewels and try to sell them to some jeweller. She did not understand the difficulties that would lie in her way, but she felt very timid. Her maid had asked permission to go out for the evening, and Monsieur de Rochemont was to dine out, so that she found it possible to leave the house without attracting attention. As soon as the streets were lighted she took the case of ornaments, and going downstairs very quietly, let herself out. The servants were dining, and she was seen by none of them. When she found herself in the snowy street she felt strangely bewildered. She had never been out unattended before, and she knew nothing of the great busy city. When she turned into the more crowded thoroughfares, she saw several times that passers-by glanced at her curiously. Her timid look, her foreign air and richly furred dress, and the fact that she was a child and alone at such an hour, could not fail to attract attention; but though she felt confused and troubled, she went bravely on. It was some time before she found a jeweller's shop, and when she entered it the men behind the counter looked at her in amazement. But she went to the one nearest to her and laid the case of jewels on the counter before him. "I wish," she said, in her soft low voice, and with the pretty accent, "I wish that you should buy these." The man stared at her, and at the ornaments, and then at her again. "I beg pardon, miss," he said. "I will speak to Mr. Moetyler," he said, after a moment of hesitation. He went to the other end of the shop to an elderly man who sat behind a desk. After he had spoken a few words, the elderly man looked up as if surprised; then he glanced at Elizabeth; then, after speaking a few more words, he came forward. "You wish to sell these?" he said, looking at the case of jewels with a puzzled expression. He bent over the case and took up one ornament after the other and examined them closely. After he had done this he looked at the little girl's innocent, trustful face, seeming more puzzled than before. "Are they your own?" he inquired. "Yes, they are mine," she replied, timidly. "Do you know how much they are worth?" "I know that they are worth much money," said Elizabeth. "I have heard it said so." "Do your friends know that you are going to sell them?" "No," Elizabeth said, a faint colour rising in her delicate face. "But it is right that I should do it." The man spent a few moments in examining them again and, having done so, spoke hesitatingly. "I am afraid we cannot buy them," he said. "It would be impossible, unless your friends first gave their permission." "Impossible!" said Elizabeth, and tears rose in her eyes, making them look softer and more wistful than ever. "We could not do it," said the jeweller. "It is out of the question under the circumstances." "Do you think," faltered the poor little saint, "do you think that nobody will buy them?" "I am afraid not," was the reply. "No respectable firm who would pay their real value. If you'll take my advice, young lady, you will take them home and consult your friends." He spoke kindly, but Elizabeth was overwhelmed with disappointment. 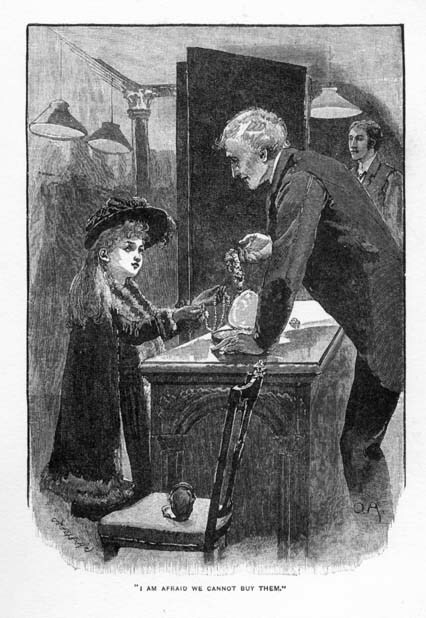 She did not know enough of the world to understand that a richly dressed little girl who offered valuable jewels for sale at night must be a strange and unusual sight. When she found herself on the street again, her long lashes were heavy with tears. "If no one will buy them," she said, "what shall I do?" She walked a long way–so long that she was very tired–and offered them at several places, but as she chanced to enter only respectable shops, the same thing happened each time. She was looked at curiously and questioned, but no one would buy. "They are mine," she would say. "It is right that I should sell them." But everyone stared and seemed puzzled, and in the end refused. 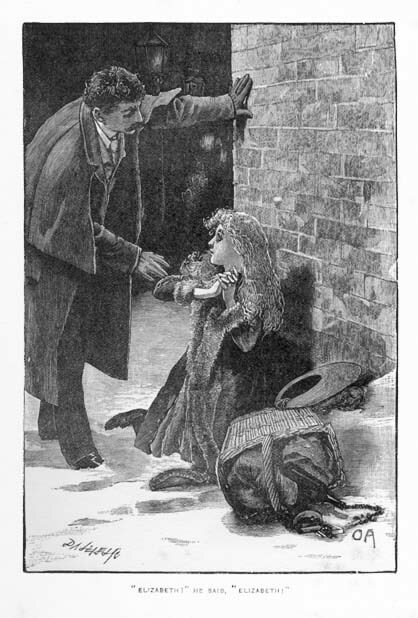 At last, after much wandering, she found herself in a poorer quarter of the city; the streets were narrower and dirtier, and the people began to look squalid and wretchedly dressed; there were smaller shops and dingy houses. She saw unkempt men and women and uncared for little children. The poverty of the poor she had seen in her own village seemed comfort and luxury by contrast. She had never dreamed of anything like this Now and then she felt faint with pain and horror. But she went on. "They have no vineyards," she said to herself. "No trees and flowers–it is all dreadful–there is nothing. They need help more than the others. To let them suffer so, and not to give them charity, would be a great crime." She was so full of grief and excitement that she had ceased to notice how everyone looked at her–she saw only the wretchedness and dirt and misery. She did not know, poor child! that she was surrounded by danger–that she was not only in the midst of misery, but of dishonesty and crime. She had even forgotten her timidity–that it was glowing late, and that she was far from home, and would not know how to return–she did not realize that she had walked so far that she was almost exhausted with fatigue. She had brought with her all the money she possessed. If she could not sell the jewels she could, at least, give something to someone in want. But she did not know to whom she must give first. When she had lived with her Aunt Clotilde it had been their habit to visit the peasants in their houses. Must she enter one of these houses–these dreadful places with the dark passages, from which she heard many times riotous voices, and even cries, issuing? "But those who do good must feel no fear," she thought. "It is only to have courage." At length something happened which caused her to pause before one of those places. She heard sounds of pitiful moans and sobbing from something crouched upon the broken steps. It seemed like a heap of rags, but as she drew near she saw by the light of the street lamp opposite that it was a woman with her head in her knees, and a wretched child on each side of her. 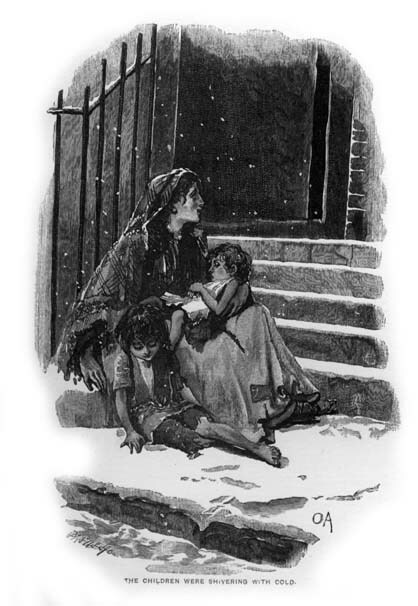 The children were shivering with cold and making low cries as if they were frightened. Elizabeth stopped and then ascended the steps. "Why is it that you cry?" she asked gently. "Tell me." The woman did not answer at first, but when Elizabeth spoke again she lifted her head, and as soon as she saw the slender figure in its velvet and furs, and the pale, refined little face, she gave a great start. "Lord have mercy on yez!" she said in a hoarse voice which sounded almost terrified. "Who are yez, an' what bees ye dow' in a place the loike o' this?" "I came," said Elizabeth, "to see those who are poor. I wish to help them. I have great sorrow for them. It is right that the rich should help those who want. Tell me why you cry, and why your little children sit in the cold." Everybody had shown surprise to whom Elizabeth had spoken tonight, but no one had stared as this woman did. "It's no place for the loike o' yez," she said. "An' it black noight, an' men and women wild in the drink; an' Pat Harrigan insoide bloind an' mad in liquor, an' it's turned me an' the children out he has to shlape in the snow–an' not the furst toime either. An' it's starvin' we are–starvin' an' no other," and she dropped her wretched head on her knees and began to moan again, and the children joined her. "Don't let yez daddy hear yez," she said to them. "Whisht now–it's come out an' kill yez he will." Elizabeth began to feel tremulous and faint. "Is it that they have hunger?" she asked. "Not a bite or sup have they had this day, nor yesterday," was the answer. "The good Saints have pity on us." "Yes," said Elizabeth, "the good Saints have always pity. I will go and get them food–poor little ones." She had seen a shop only a few yards away–she remembered passing it. Before the woman could speak again she was gone. "Yes," she said, "I was sent to them–it is the answer to my prayer–it was not in vain that I asked so long." When she entered the shop the few people who were in it stopped what they were doing to stare at her as others had done–but she scarcely saw that it was so. "Give to me a basket," she said to the owner of the place. "Put in it some bread and wine–some of the things which are ready to eat. It is for a poor woman and her little ones who starve." There was in the shop among others a red-faced woman, with a cunning look in her eyes. She sidled out of the place and was waiting for Elizabeth when she came out. "I'm starvin' too, little lady," she said. "There's many of us that way, an' it's not often them with money care about it. Give me something too," in a wheedling voice. Elizabeth looked up at her, her pure ignorant eyes full of pity. "I have great sorrows for you," she said. "Perhaps the poor woman will share her food with you." "It's money I need," said the woman. "I have none left," answered Elizabeth. "I will come again." "It's now I want it," the woman persisted. Then she looked covetously at Elizabeth's velvet fur-lined and trimmed cloak. "That's a pretty cloak you've on," she said. "You've got another, I daresay." Suddenly she gave the cloak a pull, but the fastening did not give way as she had thought it would. "Is it because you are cold that you want it?" said Elizabeth, in her gentle, innocent way. "I will give it to you. Take it." Had not all the holy ones in the legends given their garments to the poor? Why should she not give her cloak? In an instant it was unclasped and snatched away, and the woman was gone. She did not even stay long enough to give thanks for the gift, and something in her haste and roughness made Elizabeth wonder and gave her a moment of tremor. She made her way back to the place where the other woman and her children had been sitting; the cold wind made her shiver, and the basket was very heavy for her slender arm. Her strength seemed to be giving way. As she turned the corner, a great, fierce gust of wind swept round it, and caught her breath and made her stagger. She thought she was going to fall; indeed, she would have fallen but that one of the tall men who were passing put out his arm and caught her. He was a well dressed man, in a heavy overcoat; he had gloves on. Elizabeth spoke in a faint tone. "I thank you," she began, when the second man uttered a wild exclamation and sprang forward. Elizabeth looked up and uttered a cry herself. It was her Uncle Bertrand who stood before her, and his companion, who had saved her from falling, was Dr. Norris. For a moment it seemed as if they were almost struck dumb with horror; and then her Uncle Bertrand seized her by the arm in such agitation that he scarcely seemed himself–the light, satirical, jesting Uncle Bertrand she had known at all. "What does it mean?" he cried. "What are you doing here, in this horrible place, alone? Do you know where it is you have come? What have you in your basket? Explain! explain!" The moment of trial had come, and it seemed even more terrible than the poor child had imagined. The long strain and exertion had been too much for her delicate body. She felt that she could bear no more; the cold seemed to have struck to her very heart. She looked up at Monsieur de Rochemont's pale, excited face, and trembled from head to foot. A strange thought flashed into her mind. 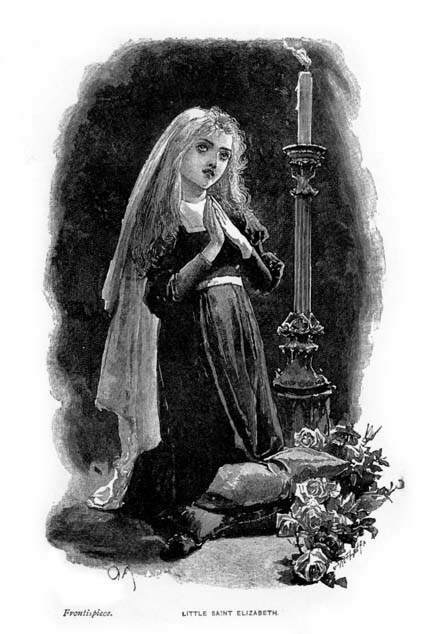 Saint Elizabeth of Thuringia–the cruel Landgrave. Perhaps the Saints would help her, too, since she was trying to do their bidding. Surely, surely it must be so! "Speak!" repeated Monsieur de Rochemont. "Why is this? The basket–what have you in it?" "Roses," said Elizabeth, "Roses." And then her strength deserted her–she fell upon her knees in the snow–the basket slipped from her arms, and the first thing which fell from it was–no, not roses,–there had been no miracle wrought–not roses, but the case of jewels which she had laid on the top of the other things that it might be the more easily carried. "Roses!" cried Uncle Bertrand. "Is it that the child is mad? They are the jewels of my sister Clotilde." Elizabeth clasped her hands and leaned towards Dr. Norris, the tears streaming from her uplifted eyes. "Ah! monsieur," she sobbed, "you will understand. It was for the poor–they suffer so much. If we do not help them our souls will be lost. I did not mean to speak falsely. I thought the Saints–the Saints––" But her sobs filled her throat, and she could not finish. Dr. Norris stopped, and took her in his strong arms as if she had been a baby. "Quick!" he said, imperatively; "we must return to the carriage De Rochemont. This is a serious matter." Elizabeth clung to him with trembling hands. "But the poor woman who starves?" she cried. 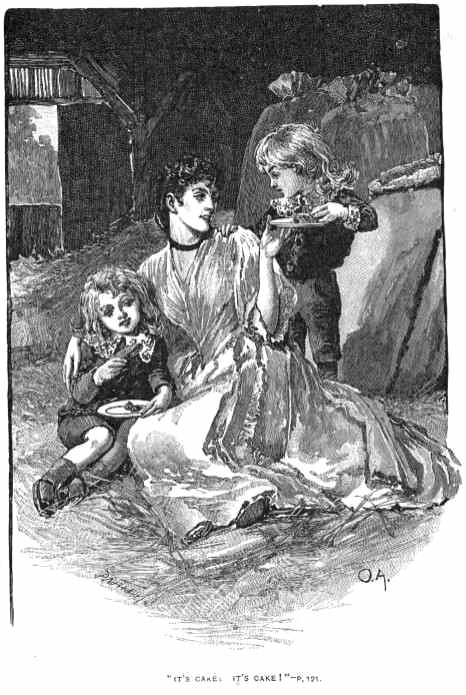 "The little children–they sit up on the step quite near–the food was for them! I pray you give it to them." "Yes, they shall have it," said the Doctor. "Take the basket, De Rochemont–only a few doors below." And it appeared that there was something in his voice which seemed to render obedience necessary, for Monsieur de Rochemont actually did as he was told. For a moment Dr. Norris put Elizabeth on her feet again, but it was only while he removed his overcoat and wrapped it about her slight shivering body. "You are chilled through, poor child," he said; "and you are not strong enough to walk just now. You must let me carry you." It was true that a sudden faintness had come upon her, and she could not restrain the shudder which shook her. It still shook her when she was placed in the carriage which the two gentlemen had thought it wiser to leave in one of the more respectable streets when they went to explore the worse ones together. "What might not have occurred if we had not arrived at that instant'" said Uncle Bertrand when he got into the carriage. "As it is, who knows what illness—"
"It will be better to say as little as possible now," said Dr. Norris. "It was for the poor," said Elizabeth, trembling. "I had prayed to the Saints to tell me what was best. I thought I must go. I did not mean to do wrong. It was for the poor." And while her Uncle Bertrand regarded her with a strangely agitated look, and Dr. Norris held her hand between his strong and warm ones, the tears rolled down her pure, pale little face. "Yes, it appears I am not discreet. Finally, I think I must leave my charities to you, my good Norris–to you and Little Saint Elizabeth." 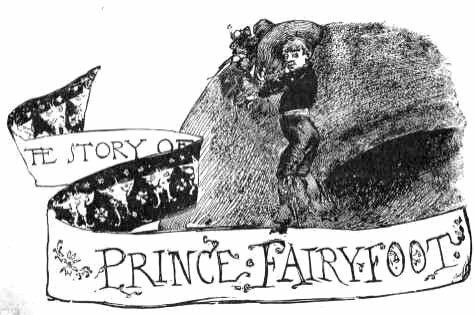 THE STORY OF PRINCE FAIRYFOOT. "When I was a child of six or seven, I had given to me a book of fairy-stories, of which I was very fond. Before it had been in my possession many months, it disappeared, and, though since then I have tried repeatedly, both in England and America, to find a copy of it, I have never been able to do so. I asked a friend in the Congressional Library at Washington–a man whose knowledge of books is almost unlimited–to try to learn something about it for me. But even he could find no trace of it; and so we concluded it must have been out of print some time. I always remembered the impression the stories had made on me, and, though most of them had become very faint recollections, I frequently told them to children, with additions of my own. The story of Fairyfoot I had promised to tell a little girl; and, in accordance with the promise, I developed the outline I remembered, introduced new characters and conversation, wrote it upon note-paper, inclosed it in a decorated satin cover, and sent it to her. In the first place, it was re-written merely for her, with no intention of publication; but she was so delighted with it, and read and re-read it so untiringly, that it occurred to me other children might like to hear it also. So I made the plan of developing and re-writing the other stories in like manner, and having them published under the title of 'Stories from the Lost Fairy-Book, Retold by the Child Who Read Them.'" The Editor of ST. NICHOLAS, to whom the foregoing facts were first communicated, was in Europe when "Prince Fairyfoot" was put into type, and, by an oversight, no explanatory note appeared with the opening chapter. 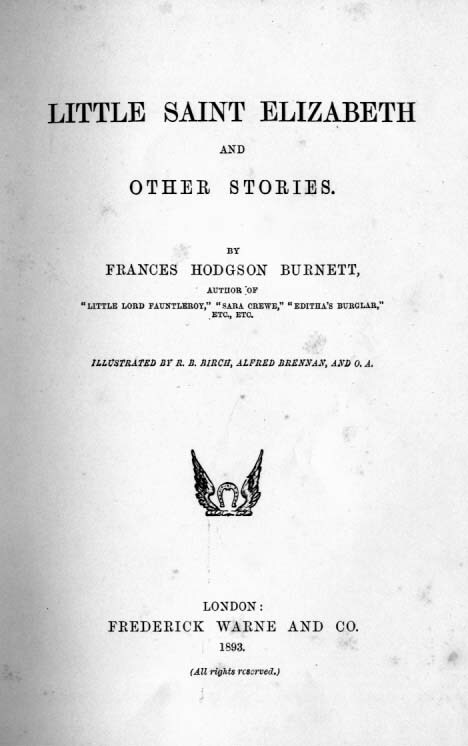 But since the publication of the story was begun in the Magazine, Mrs. Burnett's publishers received information which enabled them to obtain a copy of the lost fairy-book. It is a little volume, entitled "Granny's Wonderful Chair, and the Tales it Told," published by Messrs. Griffith and Farran. 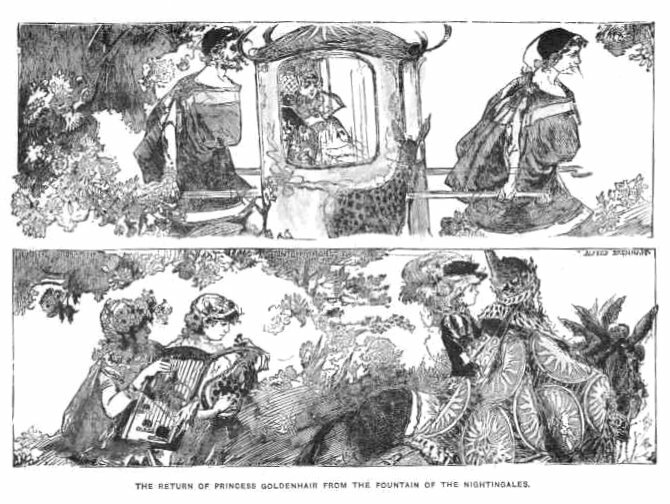 The foregoing explanation and apology are due to those publishers, as it is by their courteous permission we are able to include the story in the present volume.–FREDERICK WARNE & CO.
ONCE upon a time, in the days of the fairies, there was in the far west country a kingdom which was called by the name of Stumpinghame. It was a rather curious country in several ways. In the first place, the people who lived there thought that Stumpinghame was all the world; they thought there was no world at all outside Stumpinghame. And they thought that the people of Stumpinghame knew everything that could possibly be known, and that what they did not know was of no consequence at all. One idea common in Stumpinghame was really very unusual indeed. It was a peculiar taste in the matter of feet. In Stumpinghame, the larger a person's feet were, the more beautiful and elegant he or she was considered; and the more aristocratic and nobly born a man was, the more immense were his feet. Only the very lowest and most vulgar persons were ever known to have small feet. The King's feet were simply huge; so were the Queen's; so were those of the young princes and princesses. It had never occurred to anyone that a member of such a royal family could possibly disgrace himself by being born with small feet. Well, you may imagine, then, what a terrible and humiliating state of affairs arose when there was born into that royal family a little son, a prince, whose feet were so very small and slender and delicate that they would have been considered small even in other places than Stumpinghame. Grief and confusion seized the entire nation. The Queen fainted six times a day; the King had black rosettes fastened upon his crown; all the flags were at half-mast; and the court went into the deepest mourning. There had been born to Stumpinghame a royal prince with small feet, and nobody knew how the country could survive it! Yet the disgraceful little prince survived it, and did not seem to mind at all. He was the prettiest and best tempered baby the royal nurse had ever seen. But for his small feet, he would have been the flower of the family. The royal nurse said so herself, and privately told his little royal highness's chief bottle-washer that she "never see a hinfant as took notice so, and sneezed as hintelligent." But, of course, the King and Queen could see nothing but his little feet and very soon they made up their minds to send him away. So one day they had him bundled up and carried where they thought he might be quite forgotten. They sent him to the hut of a swineherd who lived deep, deep in a great forest which seemed to end nowhere. They gave the swineherd some money, and some clothes for Fairyfoot, and told him that if he would take care of the child, they would send money and clothes every year. As for themselves, they only wished to be sure of never seeing Fairyfoot again. This pleased the Swineherd well enough. He was poor, and he had a wife and ten children, and hundreds of swine to take care of, and he knew he could use the little Prince's money and clothes for his own family, and no one would find it out. So he let his wife take the little fellow, and, as soon as the King's messengers had gone, the woman took the royal clothes off the Prince and put on him a coarse little nightgown, and gave all his things to her own children. 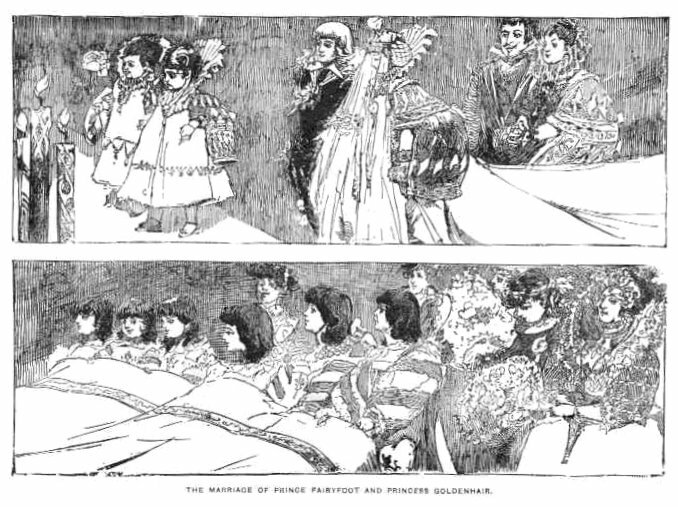 But the baby Prince did not seem to mind that–he did not seem to mind anything, even though he had no name but Prince Fairyfoot, which had been given him in contempt by the disgusted courtiers. He grew prettier and prettier every day, and long before the time when other children begin to walk, he could run about on his fairy feet. The swineherd and his wife did not like him at all; in fact, they disliked him because he was so much prettier and so much brighter than their own clumsy children. And the children did not like him, because they were ill natured and only liked themselves. So as he grew older year by year, the poor little Prince was more and more lonely. He had no one to play with, and was obliged to be always by himself. He dressed only in the coarsest and roughest clothes; he seldom had enough to eat, and he slept on straw in a loft under the roof of the swineherd's hut. But all this did not prevent his being strong and rosy and active. He was as fleet as the wind, and he had a voice as sweet as a bird's; he had lovely sparkling eyes, and bright golden hair; and he had so kind a heart that he would not have done a wrong or cruel thing for the world. As soon as he was big enough, the swineherd made him go out into the forest every day to take care of the swine. He was obliged to keep them together in one place, and if any of them ran away into the forest, Prince Fairyfoot was beaten. And as the swine were very wild and unruly, he was very often beaten, because it was almost impossible to keep them from wandering off; and when they ran away, they ran so fast, and through places so tangled, that it was almost impossible to follow them. The forest in which he had to spend the long days was a very beautiful one, however, and he could take pleasure in that. It was a forest so great that it was like a world in itself. There were in it strange, splendid trees, the branches of which interlocked overhead, and when their many leaves moved and rustled, it seemed as if they were whispering secrets. There were bright, swift, strange birds, that flew about in the deep golden sunshine, and when they rested on the boughs, they, too, seemed telling one another secrets. There was a bright, clear brook, with water as sparkling and pure as crystal, and with shining shells and pebbles of all colours lying in the gold and silver sand at the bottom. Prince Fairyfoot always thought the brook knew the forest's secret also, and sang it softly to the flowers as it ran along. And as for the flowers, they were beautiful; they grew as thickly as if they had been a carpet, and under them was another carpet of lovely green moss. The trees and the birds, and the brook and the flowers, were Prince Fairyfoot's friends. He loved them, and never was very lonely when he was with them; and if his swine had not run away so often, and if the swineherd had not beaten him so much, sometimes–indeed, nearly all summer–he would have been almost happy. 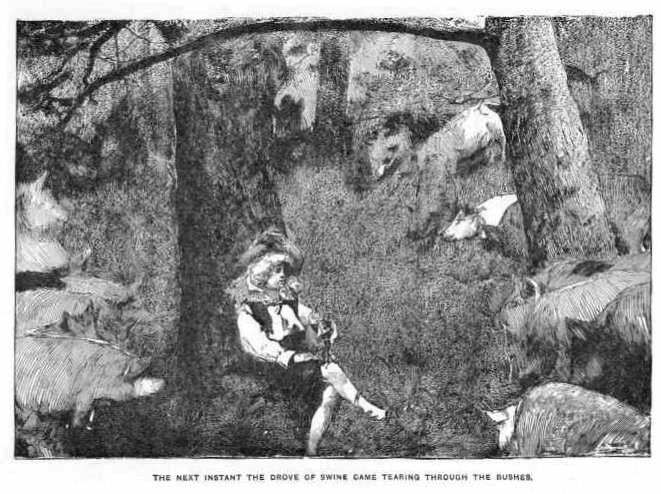 He used to lie on the fragrant carpet of flowers and moss and listen to the soft sound of the running water, and to the whispering of the waving leaves, and to the songs of the birds; and he would wonder what they were saying to one another, and if it were true, as the swineherd's children said, that the great forest was full of fairies. And then he would pretend it was true, and would tell himself stories about them, and make believe they were his friends, and that they came to talk to him and let him love them. He wanted to love something or somebody, and he had nothing to love–not even a little dog. One day he was resting under a great green tree, feeling really quite happy because everything was so beautiful. He had even made a little song to chime in with the brook's, and he was singing it softly and sweetly, when suddenly, as he lifted his curly, golden head to look about him, he saw that all his swine were gone. He sprang to his feet, feeling very much frightened, and he whistled and called, but he heard nothing. He could not imagine how they had all disappeared so quietly, without making any sound; but not one of them was anywhere to be seen. Then his poor little heart began to beat fast with trouble and anxiety. He ran here and there; he looked through the bushes and under the trees; he ran, and ran, and ran, and called, and whistled, and searched; but nowhere–nowhere was one of those swine to be found! He searched for them for hours, going deeper and deeper into the forest than he had ever been before. He saw strange trees and strange flowers, and heard strange sounds: and at last the sun began to go down, and he knew he would soon be left in the dark. His little feet and legs were scratched with brambles, and were so tired that they would scarcely carry him; but he dared not go back to the swineherd's hut without finding the swine. The only comfort he had on all the long way was that the little brook had run by his side, and sung its song to him; and sometimes he had stopped and bathed his hot face in it, and had said, "Oh, little brook! you are so kind to me! You are my friend, I know. It would be so lonely without you!" When, at last, the sun did go down, Prince Fairyfoot had wandered so far that he did not know where he was, and he was so tired that he threw himself down by the brook, and hid his face in the flowery moss, and said, "Oh, little brook I am so tired I can go no further; and I can never find them!" While he was lying there in despair, he heard a sound in the air above him, and looked up to see what it was. It sounded like a little bird in some trouble. And, surely enough, there was a huge hawk darting after a plump little brown bird with a red breast. The little bird was uttering sharp frightened cries, and Prince Fairyfoot felt so sorry for it that he sprang up and tried to drive the hawk away. The little bird saw him at once, and straightway flew to him, and Fairyfoot covered it with his cap. And then the hawk flew away in a great rage. When the hawk was gone, Fairyfoot sat down again and lifted his cap, expecting, of course, to see the brown bird with the red breast. But, instead of a bird, out stepped a little man, not much higher than your little finger–a plump little man in a brown suit with a bright red vest, and with a cocked hat on. "Why," exclaimed Fairyfoot, "I'm surprised:"
"So am I," said the little man, cheerfully. "I never was more surprised in my life, except when my great-aunt's grandmother got into such a rage, and changed me into a robin-redbreast. I tell you, that surprised me!" "I should think it might," said Fairyfoot. "Why did she do it?" "Mad," answered the little man–"that was what was the matter with her. She was always losing her temper like that, and turning people into awkward things, and then being sorry for it, and not being able to change them back again. If you are a fairy, you have to be careful. If you'll believe me, that woman once turned her second-cousin's sister-in-law into a mushroom, and somebody picked her, and she was made into catsup, which is a thing no man likes to have happen in his family!" "Of course not," said Fairyfoot, politely. "The difficulty is," said the little man, "that some fairies don't graduate. They learn to turn people into things, but they don't learn how to unturn them; and then, when they get mad in their families–you know how it is about getting mad in families–there is confusion. Yes, seriously, confusion arises. It arises. That was the way with my great-aunt's grandmother. She was not a cultivated old person, and she did not know how to unturn people, and now you see the result. Quite accidentally I trod on her favourite corn; she got mad and changed me into a robin, and regretted it ever afterward. I could only become myself again by a kind hearted person's saving me from a great danger. You are that person. Give me your hand." Fairyfoot held out his hand. The little man looked at it. "On second thought," he said, "I can't shake it–it's too large. I'll sit on it, and talk to you." With these words, he hopped upon Fairyfoot's hand, and sat down, smiling and clasping his own hands about his tiny knees. "I declare, it's delightful not to be a robin," he said. "Had to go about picking up worms, you know. Disgusting business. I always did hate worms. I never ate them myself–I drew the line there; but I had to get them for my family." Suddenly he began to giggle, and to hug his knees up tight. "Do you wish to know what I'm laughing at?" he asked Fairyfoot. The little man giggled more than ever. "I'm thinking about my wife," he said–"the one I had when I was a robin. A nice rage she'll be in when I don't come home to-night! She'll have to hustle around and pick up worms for herself, and for the children, too, and it serves her right. She had a temper that would embitter the life of a crow, much more a simple robin. I wore myself to skin and bone taking care of her and her brood, and how I did hate 'em!–bare, squawking things, always with their throats gaping open. They seemed to think a parent's sole duty was to bring worms for them." "It must have been unpleasant," said Fairyfoot. "It was more than that," said the little man; "it used to make my feathers stand on end. There was the nest, too! Fancy being changed into a robin, and being obliged to build a nest at a moment's notice! I never felt so ridiculous in my life. How was I to know how to build a nest! And the worst of it was the way she went on about it." "Oh, her, you know," replied the little man, ungrammatically, "my wife. She'd always been a robin, and she knew how to build a nest; she liked to order me about, too–she was one of that kind. But, of course, I wasn't going to own that I didn't know anything about nest-building. I could never have done anything with her in the world if I'd let her think she knew as much as I did. So I just put things together in a way of my own, and built a nest that would have made you weep! The bottom fell out of it the first night. It nearly killed me." "Did you fall out, too?" inquired Fairyfoot. "Oh, no," answered the little man. "I meant that it nearly killed me to think the eggs weren't in it at the time." "What did you do about the nest?" asked Fairyfoot. The little man winked in the most improper manner. "Do?" he said. "I got mad, of course, and told her that if she hadn't interfered, it wouldn't have happened; said it was exactly like a hen to fly around giving advice and unsettling one's mind, and then complain if things weren't right. I told her she might build the nest herself, if she thought she could build a better one. She did it, too:" And he winked again. "Was it a better one?" asked Fairyfoot. The little man actually winked a third time. "It may surprise you to hear that it was," he replied; "but it didn't surprise me. By-the-by," he added, with startling suddenness, "what's your name, and what's the matter with you?" "My name is Prince Fairyfoot," said the boy, "and I have lost my master's swine." "My name," said the little man, "is Robin Goodfellow, and I'll find them for you." He had a tiny scarlet silk pouch hanging at his girdle, and he put his hand into it and drew forth the smallest golden whistle you ever saw. "Blow that," he said, giving it to Fairyfoot, "and take care that you don't swallow it. You are such a tremendous creature!" Fairyfoot took the whistle and put it very delicately to his lips. He blew, and there came from it a high, clear sound that seemed to pierce the deepest depths of the forest. "Blow again," commanded Robin Goodfellow. Again Prince Fairyfoot blew, and again the pure clear sound rang through the trees, and the next instant he heard a loud rushing and tramping and squeaking and grunting, and all the great drove of swine came tearing through the bushes and formed themselves into a circle and stood staring at him as if waiting to be told what to do next. "Oh, Robin Goodfellow, Robin Goodfellow!" cried Fairyfoot, "how grateful I am to you!" "Not as grateful as I am to you," said Robin Goodfellow. "But for you I should be disturbing that hawk's digestion at the present moment, instead of which, here I am, a respectable fairy once more, and my late wife (though I ought not to call her that, for goodness knows she was early enough hustling me out of my nest before daybreak, with the unpleasant proverb about the early bird catching the worm! )–I suppose I should say my early wife–is at this juncture a widow. Now, where do you live?" Fairyfoot told him, and told him also about the swineherd, and how it happened that, though he was a prince, he had to herd swine and live in the forest. "Well, well," said Robin Goodfellow, "that is a disagreeable state of affairs. Perhaps I can make it rather easier for you. You see that is a fairy whistle." "I thought so," said Fairyfoot. "Well," continued Robin Goodfellow, "you can always call your swine with it, so you will never be beaten again. Now, are you ever lonely?" "Sometimes I am very lonely indeed," answered the Prince. "No one cares for me, though I think the brook is sometimes sorry, and tries to tell me things." "Of course," said Robin. "They all like you. I've heard them say so." "Oh, have you?" cried Fairyfoot, joyfully. "Yes; you never throw stones at the birds, or break the branches of the trees, or trample on the flowers when you can help it." "The birds sing to me," said Fairyfoot, "and the trees seem to beckon to me and whisper; and when I am very lonely, I lie down in the grass and look into the eyes of the flowers and talk to them. I would not hurt one of them for all the world!" "Humph!" said Robin, "you are a rather good little fellow. Would you like to go to a party?" "A party!" said Fairyfoot. "What is that?" "This sort of thing," said Robin; and he jumped up and began to dance around and to kick up his heels gaily in the palm of Fairyfoot's hand. "Wine, you know, and cake, and all sorts of fun. It begins at twelve to-night, in a place the fairies know of, and it lasts until just two minutes and three seconds and a half before daylight. Would you like to come?"
." Oh," cried Fairyfoot. "I should be so happy if I might!" "Well, you may," said Robin; "I'll take you. They'll be delighted to see any friend of mine. I'm a great favourite; of course, you can easily imagine that. It was a great blow to them when I was changed; such a loss, you know. In fact, there were several lady fairies, who–but no matter." And he gave a slight cough, and began to arrange his necktie with a disgracefully consequential air, though he was trying very hard not to look conceited; and while he was endeavouring to appear easy and gracefully careless, he began accidentally to hum, "See the Conquering Hero Comes," which was not the right tune under the circumstances. "But for you," he said next, "I couldn't have given them the relief and pleasure of seeing me this evening. And what ecstasy it will be to them, to be sure! I shouldn't be surprised if it broke up the whole thing. They'll faint so–for joy, you know–just at first–that is, the ladies will The men won't like it at all; and I don't blame 'em. I suppose I shouldn't like it–to see another fellow sweep all before him. That's what I do; I sweep all before me." And he waved his hand in such a fine large gesture that he overbalanced himself, and turned a somersault. But he jumped up after it quite undisturbed. "You'll see me do it to-night," he said, knocking the dents out of his hat–"sweep all before me." Then he put his hat on, and his hands on his hips, with a swaggering, man-of-society air. "I say," he said, "I'm glad you're going. I should like you to see it." "And I should like to see it," replied Fairyfoot. "Well," said Mr. Goodfellow, "you deserve it, though that's saying a great deal. You've restored me to them. But for you, even if I'd escaped that hawk, I should have had to spend the night in that beastly robin's nest, crowded into a corner by those squawking things, and domineered over by her! I wasn't made for that! I'm superior to it. Domestic life doesn't suit me. I was made for society. I adorn it. She never appreciated me. She couldn't soar to it. When I think of the way she treated me," he exclaimed, suddenly getting into a rage, "I've a great mind to turn back into a robin and peck her head off!" "Would you like to see her now?" asked Fairyfoot, innocently. Mr. Goodfellow glanced behind him in great haste, and suddenly sat down. "No, no!" he exclaimed in a tremendous hurry; "by no means! She has no delicacy. And she doesn't deserve to see me. And there's a violence and uncertainty about her movements which is annoying beyond anything you can imagine. No, I don't want to see her! I'll let her go unpunished for the present. Perhaps it's punishment enough for her to be deprived of me. Just pick up your cap, won't you? and if you see any birds lying about, throw it at them, robins particularly." "I think I must take the swine home, if you'll excuse me," said Fairy foot, "I'm late now." "Well, let me sit on your shoulder and I'll go with you and show you a short way home," said Goodfellow; "I know all about it, so you needn't think about yourself again. In fact, we'll talk about the party. Just blow your whistle, and the swine will go ahead." Fairyfoot did so, and the swine rushed through the forest before them, and Robin Goodfellow perched himself on the Prince's shoulder, and chatted as they went. It had taken Fairyfoot hours to reach the place where he had found Robin, but somehow it seemed to him only a very short time before they came to the open place near the swineherd's hut; and the path they had walked in had been so pleasant and flowery that it had been delightful all the way. "Now," said Robin, when they stopped, "if you will come here to-night at twelve o'clock, when the moon shines under this tree, you will find me waiting for you. Now I'm going. Good-bye!" And he was gone before the last word was quite finished. Fairyfoot went towards the hut, driving the swine before him, and suddenly he saw the swineherd come out of his house, and stand staring stupidly at the pigs. He was a very coarse, hideous man, with bristling yellow hair, and little eyes, and a face rather like a pig's, and he always looked stupid, but just now he looked more stupid than ever. He seemed dumb with surprise. "What's the matter with the swine?" he asked in his hoarse voice, which was rather pig-like, too. "I don't know," answered Fairyfoot, feeling a little alarmed. "What is the matter with them?" "They are four times fatter, and five times bigger, and six times cleaner, and seven times heavier, and eight times handsomer than they were when you took them out," the swineherd said. "I've done nothing to them," said Fairyfoot. "They ran away, but they came back again." The swineherd went lumbering back into the hut, and called his wife. "Come and look at the swine," he said. And then the woman came out, and stared first at the swine and then at Fairyfoot. "He has been with the fairies," she said at last to her husband; "or it is because he is a king's son. We must treat him better if he can do wonders like that." IN went the swineherd's wife, and she prepared quite a good supper for Fairyfoot and gave it to him. But Fairyfoot was scarcely hungry at all; he was so eager for night to come, so that he might see the fairies. When he went to his loft under the roof, he thought at first he could not sleep; but suddenly his hand touched the fairy whistle and he fell asleep at once, and did not waken again until a moonbeam fell brightly upon his face and aroused him. Then he jumped up and ran to the hole in the wall to look out, and he saw that the hour had come, and that the moon was so low in the sky that its slanting light had crept under the oak-tree. He slipped downstairs so lightly that his master heard nothing, and then he found himself out in the beautiful night with the moonlight so bright that it was lighter than daytime. And there was Robin Goodfellow waiting for him under the tree! He was so finely dressed that, for a moment, Fairyfoot scarcely knew him. His suit was made out of the purple velvet petals of a pansy, which was far finer than any ordinary velvet, and he wore plumes and tassels, and a ruffle around his neck, and in his belt was thrust a tiny sword, not half as big as the finest needle. "Take me on your shoulder," he said to Fairyfoot, "and I will show you the way." Fairyfoot took him up, and they went their way through the forest. And the strange part of it was that though Fairyfoot thought he knew all the forest by heart, every path they took was new to him, and more beautiful than anything he had ever seen before. The moonlight seemed to grow brighter and purer at every step, and the sleeping flowers sweeter and lovelier, and the moss greener and thicker. Fairyfoot felt so happy and gay that he forgot he had ever been sad and lonely in his life. Robin Goodfellow, too, seemed to be in very good spirits. He related a great many stories to Fairyfoot, and, singularly enough, they all were about himself and divers and sundry fairy ladies who had been so very much attached to him that he scarcely expected to find them alive at the present moment. He felt quite sure they must have died of grief in his absence. "I have caused a great deal of trouble in the course of my life," he said, regretfully, shaking his head. "I have sometimes wished I could avoid it, but that is impossible. Ahem! When my great-aunt's grandmother rashly and inopportunely changed me into a robin, I was having a little flirtation with a little creature who was really quite attractive. I might have decided to engage myself to her. She was very charming. Her name was Gauzita. To-morrow I shall go and place flowers on her tomb." "I thought fairies never died," said Fairyfoot. "Only on rare occasions, and only from love," answered Robin. "They needn't die unless they wish to. They have been known to do it through love. They frequently wish they hadn't afterward–in fact, invariably–and then they can come to life again. But Gauzita–"
"Are you quite sure she is dead?" asked Fairyfoot. "Sure!" cried Mr. Goodfellow, in wild indignation, "why, she hasn't seen me for a couple of years. I've moulted twice since last we met. I congratulate myself that she didn't see me then," he added, in a lower voice. "Of course she's dead," he added, with solemn emphasis; "as dead as a door nail." Just then Fairyfoot heard some enchanting sounds, faint, but clear. They were sounds of delicate music and of tiny laughter, like the ringing of fairy bells. "Ah!" said Robin Goodfellow, "there they are! But it seems to me they are rather gay, considering they have not seen me for so long. Turn into the path." Almost immediately they found themselves in a beautiful little dell, filled with moonlight, and with glittering stars in the cup of every flower; for there were thousands of dewdrops, and every dewdrop shone like a star. There were also crowds and crowds of tiny men and women, all beautiful, all dressed in brilliant, delicate dresses, all laughing or dancing or feasting at the little tables, which were loaded with every dainty the most fastidious fairy could wish for. "Now," said Robin Goodfellow, "you shall see me sweep all before me. Put me down." Fairyfoot put him down, and stood and watched him while he walked forward with a very grand manner. He went straight to the gayest and largest group he could see. It was a group of gentlemen fairies, who were crowding around a lily of the valley, on the bent stem of which a tiny lady fairy was sitting, airily swaying herself to and fro, and laughing and chatting with all her admirers at once. She seemed to be enjoying herself immensely; indeed, it was disgracefully plain that she was having a great deal of fun. One gentleman fairy was fanning her, one was holding her programme, one had her bouquet, another her little scent bottle, and those who had nothing to hold for her were scowling furiously at the rest. It was evident that she was very popular, and that she did not object to it at all; in fact, the way her eyes sparkled and danced was distinctly reprehensible. "You have engaged to dance the next waltz with every one of us!" said one of her adorers. "How are you going to do it?" "Did I engage to dance with all of you?" she said, giving her lily stem the sauciest little swing, which set all the bells ringing. "Well, I am not going to dance it with all." "Not with me?" the admirer with the fan whispered in her ear. She gave him the most delightful little look, just to make him believe she wanted to dance with him but really couldn't. Robin Goodfellow saw her. And then she smiled sweetly upon all the rest, every one of them. Robin Goodfellow saw that, too. "I am going to sit here and look at you, and let you talk to me," she said. "I do so enjoy brilliant conversation." All the gentlemen fairies were so much elated by this that they began to brighten up, and settle their ruffs, and fall into graceful attitudes, and think of sparkling things to say; because every one of them knew, from the glance of her eyes in his direction, that he was one whose conversation was brilliant; everyone knew there could be no mistake about its being himself that she meant. The way she looked just proved it. 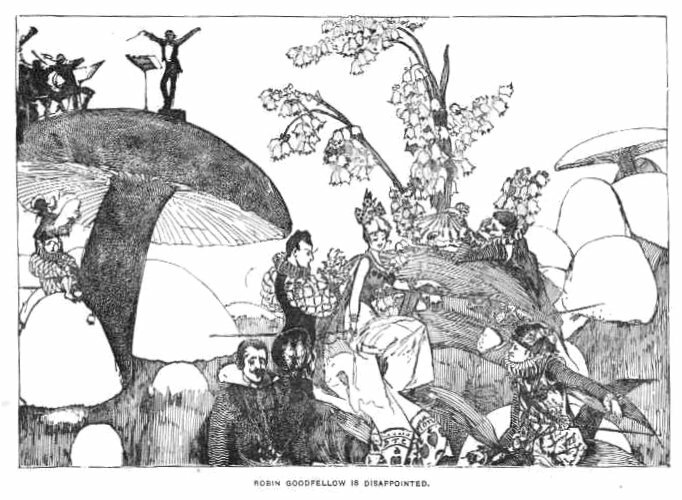 Altogether it was more than Robin Goodfellow could stand, for it was Gauzita who was deporting herself in this unaccountable manner, swinging on lily stems, and "going on," so to speak, with several parties at once, in a way to chill the blood of any proper young lady fairy–who hadn't any partner at all. It was Gauzita herself. He made his way into the very centre of the group. "Gauzita!" he said. He thought, of course, she would drop right off her lily stem; but she didn't. She simply stopped swinging a moment, and stared at him. "Gracious!" she exclaimed. "And who are you?" "Who am I?" cried Mr. Goodfellow, severely. "Don't you remember me?" "No," she said, coolly; "I don't, not in the least." Robin Goodfellow almost gasped for breath. He had never met with anything so outrageous in his life. "You don't remember me?" he cried. Me ! Why, it's impossible!" "Is it?" said Gauzita, with a touch of dainty impudence. "What's your name?" Robin Goodfellow was almost paralyzed. Gauzita took up a midget of an eyeglass which she had dangling from a thread of a gold chain, and she stuck it in her eye and tilted her impertinent little chin and looked him over. Not that she was near-sighted–not a bit of it; it was just one of her tricks and manners. "Dear me!" she said, "you do look a trifle familiar. It isn't, it can't be, Mr.—, Mr.—," then she turned to the adorer, who held her fan, "it can't be Mr.—, the one who was changed into a robin, you know," she said. "Such a ridiculous thing to be changed into! What was his name?" "Oh, yes! I know whom you mean. Mr.—, ah–Goodfellow!" said the fairy with the fan. "So it was," she said, looking Robin over again. "And he has been pecking at trees and things, and hopping in and out of nests ever since, I suppose. How absurd! And we have been enjoying ourselves so much since he went away! I think I never did have so lovely a time as I have had during these last two years. I began to know you," she added, in a kindly tone, "just about the time he went away." "You have been enjoying yourself?" almost shrieked Robin Goodfellow. "Well," said Gauzita, in unexcusable slang, "I must smile." And she did smile. "And nobody has pined away and died?" cried Robin. "I haven't," said Gauzita, swinging herself and ringing her bells again. "I really haven't had time." Robin Goodfellow turned around and rushed out of the group. He regarded this as insulting. He went back to Fairyfoot in such a hurry that he tripped on his sword and fell, and rolled over so many times that Fairyfoot had to stop him and pick him up. "Is she dead?" asked Fairyfoot. "No," said Robin; "she isn't." He sat down on a small mushroom and clasped his hands about his knees and looked mad–just mad. Angry or indignant wouldn't express it. "I have a great mind to go and be a misanthrope," he said. "Oh! I wouldn't," said Fairyfoot. He didn't know what a misanthrope was, but he thought it must be something unpleasant. "Wouldn't you?" said Robin, looking up at him. "'Well," said Robin, "I guess I won't. Let's go and have some fun. They are all that way. You can't depend on any of them. Never trust one of them. I believe that creature has been engaged as much as twice since I left. By a singular coincidence," he added, "I have been married twice myself–but, of course, that's different. I'm a man, you know, and–well, it's different. We won't dwell on it. Let's go and dance. But wait a minute first." He took a little bottle from his pocket. "If you remain the size you are," he continued, "you will tread on whole sets of lancers and destroy entire germans. If you drink this, you will become as small as we are; and then, when you are going home, I will give you something to make you large again." Fairyfoot drank from the little flagon, and immediately he felt himself growing smaller and smaller until at last he was as small as his companion. "Now, come on," said Robin. On they went and joined the fairies, and they danced and played fairy games and feasted on fairy dainties, and were so gay and happy that Fairyfoot was wild with joy. Everybody made him welcome and seemed to like him, and the lady fairies were simply delightful, especially Gauzita, who took a great fancy to him. Just before the sun rose, Robin gave him something from another flagon, and he grew large again, and two minutes and three seconds and a half before daylight the ball broke up, and Robin took him home and left him, promising to call for him the next night. Every night throughout the whole summer the same thing happened. At midnight he went to the fairies' dance; and at two minutes and three seconds and a half before dawn he came home. He was never lonely any more, because all day long he could think of what pleasure he would have when the night came and, besides that, all the fairies were his friends. But when the summer was coming to an end, Robin Goodfellow said to him: "This is our last dance–at least, it will be our last for some time. At this time of the year we always go back to our own country, and we don't return until spring." This made Fairyfoot very sad. He did not know how he could bear to be left alone again, but he knew it could not be helped; so he tried to be as cheerful as possible, and he went to the final festivities, and enjoyed himself more than ever before, and Gauzita gave him a tiny ring for a parting gift. But the next night, when Robin did not come for him, he felt very lonely indeed, and the next day he was so sorrowful that he wandered far away into the forest, in the hope of finding something to cheer him a little. He wandered so far that he became very tired and thirsty, and he was just making up his mind to go home, when he thought he heard the sound of falling water. It seemed to come from behind a thicket of climbing roses; and he went towards the place and pushed the branches aside a little, so that he could look through. What he saw was a great surprise to him. Though it was the end of summer, inside the thicket the roses were blooming in thousands all around a pool as clear as crystal, into which the sparkling water fell from a hole in the rock above. It was the most beautiful, clear pool that Fairyfoot had ever seen, and he pressed his way through the rose branches, and, entering the circle they inclosed, he knelt by the water and drank. Almost instantly his feeling of sadness left him, and he felt quite happy and refreshed. He stretched himself on the thick perfumed moss, and listened to the tinkling of the water, and it was not long before he fell asleep. When he awakened the moon was shining, the pool sparkled like a silver plaque crusted with diamonds, and two nightingales were singing in the branches over his head. And the next moment he found out that he understood their language just as plainly as if they had been human beings instead of birds. The water with which he had quenched his thirst was enchanted, and had given him this new power. "Poor boy!" said one nightingale, "he looks tired; I wonder where he came from." "Why, my dear," said the other "is it possible you don't know that he is Prince Fairyfoot?" "What!" said the first nightingale–"the King of Stumpinghame's son, who was born with small feet?" "Yes," said the second. "And the poor child has lived in the forest, keeping the swineherd's pigs ever since. And he is a very nice boy, too–never throws stones at birds or robs nests." "What a pity he doesn't know about the pool where the red berries grow!" said the first nightingale. "WHAT pool–and what red berries?" asked the second nightingale. "Why, my dear," said the first, "is it possible you don't know about the pool where the red berries grow–the pool where the poor, dear Princess Goldenhair met with her misfortune?" "Never heard of it," said the second nightingale, rather crossly. "Well," explained the other, "you have to follow the brook for a day and three-quarters, and then take all the paths to the left until you come to the pool. It is very ugly and muddy, and bushes with red berries on them grow around it." "Well, what of that?" said her companion; "and what happened to the Princess Goldenhair?" "Don't you know that, either?" exclaimed her friend. "Ah!" said the first nightingale, "it was very sad. She went out with her father, the King, who had a hunting party; and she lost her way, and wandered on until she came to the pool. Her poor little feet were so hot that she took off her gold-embroidered satin slippers, and put them into the water–her feet, not the slippers–and the next minute they began to grow and grow, and to get larger and larger, until they were so immense she could hardly walk at all; and though all the physicians in the kingdom have tried to make them smaller, nothing can be done, and she is perfectly unhappy." "What a pity she doesn't know about this pool!" said the other bird. "If she just came here and bathed them three times in the water, they would be smaller and more beautiful than ever, and she would be more lovely than she has ever been." "It is a pity," said her companion; "but, you know, if we once let people know what this water will do, we should be overrun with creatures bathing themselves beautiful, and trampling our moss and tearing down our rose-trees, and we should never have any peace." "That is true," agreed the other. Very soon after they flew away, and Fairyfoot was left alone. He had been so excited while they were talking that he had been hardly able to lie still. He was so sorry for the Princess Goldenhair, and so glad for himself. Now he could find his way to the pool with the red berries, and he could bathe his feet in it until they were large enough to satisfy Stumpinghame; and he could go back to his father's court, and his parents would perhaps be fond of him. But he had so good a heart that he could not think of being happy himself and letting others remain unhappy, when he could help them. So the first thing was to find the Princess Goldenhair and tell her about the nightingales' fountain. But how was he to find her? The nightingales had not told him. He was very much troubled, indeed. How was he to find her? Suddenly, quite suddenly, he thought of the ring Gauzita had given him. When she had given it to him she had made an odd remark. "When you wish to go anywhere," she had said, "hold it in your hand, turn around twice with closed eyes, and something queer will happen." He had thought it was one of her little jokes, but now it occurred to him that at least he might try what would happen. So he rose up, held the ring in his hand, closed his eyes, and turned around twice. What did happen was that he began to walk, not very fast, but still passing along as if he were moving rapidly. He did not know where he was going, but he guessed that the ring did, and that if he obeyed it, he should find the Princess Goldenhair. He went on and on, not getting in the least tired, until about daylight he found himself under a great tree, and on the ground beneath it was spread a delightful breakfast, which he knew was for him. He sat down and ate it, and then got up again and went on his way once more. Before noon he had left the forest behind him, and was in a strange country. He knew it was not Stumpinghame, because the people had not large feet. But they all had sad faces, and once or twice, when he passed groups of them who were talking, he heard them speak of the Princess Goldenhair, as if they were sorry for her and could not enjoy themselves while such a misfortune rested upon her. "So sweet and lovely and kind a princess!" they said; "and it really seems as if she would never be any better." The sun was just setting when Fairyfoot came in sight of the palace. It was built of white marble, and had beautiful pleasure-grounds about it, but somehow there seemed to be a settled gloom in the air. Fairyfoot had entered the great pleasure-garden, and was wondering where it would be best to go first, when he saw a lovely white fawn, with a golden collar around its neck, come bounding over the flower-beds, and he heard, at a little distance, a sweet voice, saying, sorrowfully, "Come back, my fawn; I cannot run and play with you as once I used to. Do not leave me, my little friend." And soon from behind the trees came a line of beautiful girls, walking two by two, all very slowly; and at the head of the line, first of all, came the loveliest princess in the world, dressed softly in pure white, with a wreath of lilies on her long golden hair, which fell almost to the hem of her white gown. She had so fair and tender a young face, and her large, soft eyes, yet looked so sorrowful, that Fairyfoot loved her in a moment, and he knelt on one knee, taking off his cap and bending his head until his own golden hair almost hid his face. "Beautiful Princess Goldenhair, beautiful and sweet Princess, may I speak to you?" he said. The Princess stopped and looked at him, and answered him softly. It surprised her to see one so poorly dressed kneeling before her, in her palace gardens, among the brilliant flowers but she always spoke softly to everyone. "What is there that I can do for you, my friend?" she said. "Beautiful Princess," answered Fairyfoot, blushing, "I hope very much that I may be able to do something for you." "For me!" she exclaimed. "Thank you, friend; what is it you can do? Indeed, I need a help I am afraid no one can ever give me." "Gracious and fairest lady," said Fairyfoot, "it is that help I think–nay, I am sure–that I bring to you." "Oh!" said the sweet princess. "You have a kind face and most true eyes, and when I look at you–I do not know why it is, but I feel a little happier. What is it you would say to me?" Still kneeling before her, still bending his head modestly, and still blushing, Fairyfoot told his story. He told her of his own sadness and loneliness, and of why he was considered so terrible a disgrace to his family. He told her about the fountain of the nightingales and what he had heard there and how he had journeyed through the forest, and beyond it into her own country, to find her. And while he told it, her beautiful face changed from red to white, and her hands closely clasped themselves together. "Oh!" she said, when he had finished, "I know that this is true from the kind look in your eyes, and I shall be happy again. And how can I thank you for being so good to a poor little princess whom you had never seen?" "Only let me see you happy once more, most sweet Princess," answered Fairyfoot, "and that will be all I desire–only if, perhaps, I might once–kiss your hand." She held out her hand to him with so lovely a look in her soft eyes that he felt happier than he had ever been before, even at the fairy dances. This was a different kind of happiness. Her hand was as white as a dove's wing and as soft as a dove's breast. "Come," she said, "let us go at once to the King." Within a few minutes the whole palace was in an uproar of excitement. Preparations were made to go to the fountain of the nightingales immediately. Remembering what the birds had said about not wishing to be disturbed, Fairyfoot asked the King to take only a small party. So no one was to go but the King himself, the Princess, in a covered chair carried by two bearers, the Lord High Chamberlain, two Maids of Honour, and Fairyfoot. Before morning they were on their way, and the day after they reached the thicket of roses, and Fairyfoot pushed aside the branches and led the way into the dell. The Princess Goldenhair sat down upon the edge of the pool and put her feet into it. In two minutes they began to look smaller. She bathed them once, twice, three times, and, as the nightingales had said, they became smaller and more beautiful than ever. As for the Princess herself, she really could not be more beautiful than she had been; but the Lord High Chamberlain, who had been an exceedingly ugly old gentleman, after washing his face, became so young and handsome that the First Maid of Honour immediately fell in love with him. Whereupon she washed her face, and became so beautiful that he fell in love with her, and they were engaged upon the spot. The Princess could not find any words to tell Fairyfoot how grateful she was and how happy. She could only look at him again and again with her soft, radiant eyes, and again and again give him her hand that he might kiss it. She was so sweet and gentle that Fairyfoot could not bear the thought of leaving her; and when the King begged him to return to the palace with them and live there always, he was more glad than I can tell you. To be near this lovely Princess, to be her friend, to love and serve her and look at her every day, was such happiness that he wanted nothing more. But first he wished to visit his father and mother and sisters and brothers in Stumpinghame! so the King and Princess and their attendants went with him to the pool where the red berries grew; and after he had bathed his feet in the water they were so large that Stumpinghame contained nothing like them, even the King's and Queen's seeming small in comparison. And when, a few days later, he arrived at the Stumpinghame Palace, attended in great state by the magnificent retinue with which the father of the Princess Goldenhair had provided him, he was received with unbounded rapture by his parents. The King and Queen felt that to have a son with feet of such a size was something to be proud of, indeed. They could not admire him sufficiently, although the whole country was illuminated, and feasting continued throughout his visit. But though he was glad to be no longer a disgrace to his family, it cannot be said that he enjoyed the size of his feet very much on his own account. 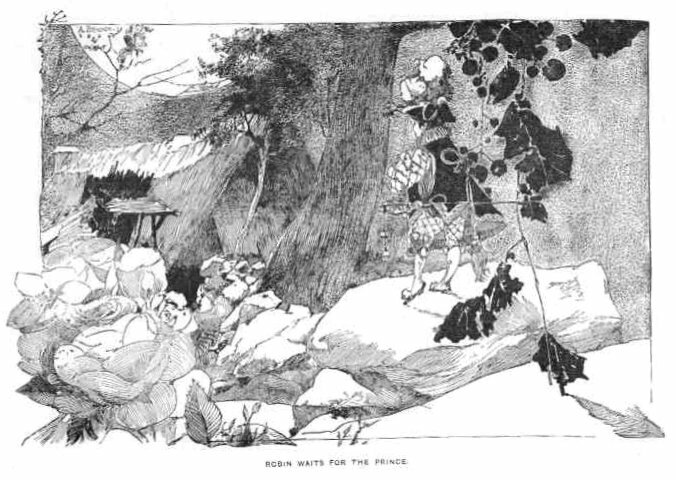 Indeed, he much preferred being Prince Fairyfoot, as fleet as the wind and as light as a young deer and he was quite glad to go to the fountain of the nightingales after his visit was at an end, and bathe his feet small again, and to return to the palace of the Princess Goldenhair with the soft and tender eyes. There everyone loved him, and he loved everyone, and was four times as happy as the day is long. He loved the Princess more dearly every day, and, of course, as soon as they were old enough, they were married. And of course, too, they used to go in the summer to the forest, and dance in the moonlight with the fairies, who adored them both. When they went to visit Stumpinghame, they always bathed their feet in the pool of the red berries; and when they returned, they made them small again in the fountain of the nightingales. They were always great friends with Robin Goodfellow, and he was always very confidential with them about Gauzita, who continued to be as pretty and saucy as ever. "Some of these days," he used to say, severely, "I'll marry another fairy, and see how she'll like that–to see someone else basking in my society! I'll get even with her!" THE PROUD LITTLE GRAIN OF WHEAT. THERE once was a little grain of wheat which was very proud indeed. The first thing it remembered was being very much crowded and jostled by a great many other grains of wheat, all living in the same sack in the granary. It was quite dark in the sack, and no one could move about, and so there was nothing to be done but to sit still and talk and think. The proud little grain of wheat talked a great deal, but did not think quite so much, while its next neighbour thought a great deal and only talked when it was asked questions it could answer. It used to say that when it thought a great deal it could remember things which it seemed to have heard a long time ago. "What is the use of our staying here so long doing nothing, and never being seen by anybody?" the proud little grain once asked. "I don't know," the learned grain replied. "I don't know the answer to that. Ask me another." "Why can't I sing like the birds that build their nests in the roof? I should like to sing, instead of sitting here in the dark." "Because you have no voice," said the learned grain. This was a very good answer indeed. "Why didn't someone give me a voice, then–why didn't they?" said the proud little grain, getting very cross. The learned grain thought for several minutes. "There might be two answers to that," she said at last. "One might be that nobody had a voice to spare, and the other might be that you have nowhere to put one if it were given to you." "Everybody is better off than I am," said the proud little grain. "The birds can fly and sing, the children can play and shout. I am sure I can get no rest for their shouting and playing. There are two little boys who make enough noise to deafen the whole sackful of us." "Ah! I know them," said the learned grain. "And it's true they are noisy. Their names are Lionel and Vivian. There is a thin place in the side of the sack, through which I can see them. I would rather stay where I am than have to do all they do. They have long yellow hair, and when they stand on their heads the straw sticks in it and they look very curious. I heard a strange thing through listening to them the other day." "What was it?" asked the proud grain. "They were playing in the straw, and someone came in them–it was a lady who had brought them something on plate. They began to dance and shout: 'It's cake! It's cake! Nice little mamma for bringing us cake.' And then they each sat down with a piece and began to take great bites of it. I shuddered to think of it afterward." "She said she 'didn't know' to all but the two first, and then he asked two more. "It was the answer to that which made me shudder." "She said it was made of–wheat! I don't see the advantage of being rich—." "Was the cake rich?" asked the proud grain. "Their mother said it was. She said, 'Don't eat it so fast–it is very rich.'" "Ah!" said the proud grain. "I should like to be rich. It must be very fine to be rich. If I am ever made into cake, I mean to be so rich that no one will dare to eat me at all." "Ah?" said the learned grain. "I don't think those boys would be afraid to eat you, however rich you were. They are not afraid of richness." "They'd be afraid of me before they had done with me," said the proud grain. "I am not a common grain of wheat. Wait until I am made into cake. But gracious me! there doesn't seem much prospect of it while we are shut up here. How dark and stuffy it is, and how we are crowded, and what a stupid lot the other grains are! I'm tired of it, I must say." "We are all in the same sack," said the learned grain, very quietly. It was a good many days after that, that something happened. Quite early in the morning, a man and a boy came into the granary, and moved the sack of wheat from its place, wakening all the grains from their last nap. "What is the matter?" said the proud grain. "Who is daring to disturb us?" "Hush!" whispered the learned grain, in the most solemn manner. "Something is going to happen. Something like this happened to somebody belonging to me long ago. I seem to remember it when I think very hard. I seem to remember something about one of my family being sown." "What is sown?" demanded the other grain. "It is being thrown into the earth," began the learned grain. Oh, what a passion the proud grain got into! "Into the earth?" she shrieked out. "Into the common earth? The earth is nothing but dirt, and I am not a common grain of wheat. I won't be sown! I will not be sown! How dare anyone sow me against my will! I would rather stay in the sack." But just as she was saying it, she was thrown out with the learned grain and some others into another dark place, and carried off by the farmer, in spite of her temper; for the farmer could not hear her voice at all, and wouldn't have minded it if he had, because he knew she was only a grain of wheat, and ought to be sown, so that some good might come of her. Well, she was carried out to a large field in the pouch which the farmer wore at his belt. The field had been ploughed, and there was a sweet smell of fresh earth in the air; the sky was a deep, deep blue, but the air was cool and the few leaves on the trees were brown and dry, and looked as if they had been left over from last year. "Ah!" said the learned grain. "It was just such a day as this when my grandfather, or my father, or somebody else related to me, was sown. I think I remember that it was called Early Spring." "As for me," said the proud grain, fiercely, "I should like to see the man who would dare to sow me!" At that very moment, the farmer put his big, brown hand into the bag and threw her, as she thought, at least half a mile from them. He had not thrown her so far as that, however, and she landed safely in the shadow of a clod of rich earth, which the sun had warmed through and through. She was quite out of breath and very dizzy at first, but in a few seconds she began to feel better and could not help looking around, in spite of her anger, to see if there was anyone near to talk to. But she saw no one, and so began to scold as usual. "They not only sow me," she called out, "but they throw me all by myself, where I can have no company at all. It is disgraceful." Then she heard a voice from the other side of the clod. It was the learned grain, who had fallen there when the farmer threw her out of his pouch. "Don't be angry," it said, "I am here. We are all right so far. Perhaps, when they cover us with the earth, we shall be even nearer to each other than we are now." "Do you mean to say they will cover us with the earth?" asked the proud grain. "Yes," was the answer. "And there we shall lie in the dark, and the rain will moisten us, and the sun will warm us, until we grow larger and larger, and at last burst open!" "Speak for yourself," said the proud grain; "I shall do no such thing!" But it all happened just as the learned grain had said, which showed what a wise grain it was, and how much it had found out just by thinking hard and remembering all it could. Before the day was over, they were covered snugly up with the soft, fragrant, brown earth, and there they lay day after day. One morning, when the proud grain wakened, it found itself wet through and through with rain which had fallen in the night, and the next day the sun shone down and warmed it so that it really began to be afraid that it would be obliged to grow too large for its skin, which felt a little tight for it already. It said nothing of this to the learned grain, at first, because it was determined not to burst if it could help it; but after the same thing had happened a great many times, it found, one morning, that it really was swelling, and it felt obliged to tell the learned grain about it. "Well," it said, pettishly, "I suppose you will be glad to hear that you were right. I am going to burst. My skin is so tight now that it doesn't fit me at all, and I know I can't stand another warm shower like the last." "Oh!" said the learned grain, in a quiet way (really learned people always have a quiet way), "I knew I was right, or I shouldn't have said so. I hope you don't find it very uncomfortable. I think I myself shall burst by to-morrow." "Of course I find it uncomfortable," said the proud grain. "Who wouldn't find it uncomfortable, to be two or three sizes too small for one's self! Pouf! Crack! There I go! I have split up all up my right side, and I must say it's a relief." "Crack! Pouf! so have I," said the learned grain. "Now we must begin to push up through the earth. I am sure my relation did that." "Well, I shouldn't mind getting out into the air. It would be a change at least." So each of them began to push her way through the earth as strongly as she could, and, sure enough, it was not long before the proud grain actually found herself out in the world again, breathing the sweet air, under the blue sky, across which fleecy white clouds were drifting, and swift-winged, happy birds darting. "It really is a lovely day," were the first words the proud grain said. It couldn't help it. The sunshine was so delightful, and the birds chirped and twittered so merrily in the bare branches, and, more wonderful than all, the great field was brown no longer, but was covered with millions of little, fresh green blades, which trembled and bent their frail bodies before the light wind. "This is an improvement," said the proud grain. Then there was a little stir in the earth beside it, and up through the brown mould came the learned grain, fresh bright, green, like the rest. "I told you I was not a common grain of wheat," said the proud one. "You are not a grain of wheat at all now," said the learned one, modestly. "You are a blade of wheat, and there are a great many others like you." "See how green I am!" said the proud blade. "Yes, you are very green," said its companion. "You will not be so green when you are older." The proud grain, which must be called a blade now, had plenty of change and company after this. It grew taller and taller every day, and made a great many new acquaintances as the weather grew warmer. These were little gold and green beetles living near it, who often passed it, and now and then stopped to talk a little about their children and their journeys under the soil. Birds dropped down from the sky sometimes to gossip and twitter of the nests they were building in the apple-trees, and the new songs they were learning to sing. Once, on a very warm day, a great golden butterfly, floating by on his large lovely wings, fluttered down softly and lit on the proud blade, who felt so much prouder when he did it that she trembled for joy. "He admires me more than all the rest in the field, you see," it said, haughtily. "That is because I am so green." "If I were you," said the learned blade, in its modest way, "I believe I would not talk so much about being green. People will make such ill-natured remarks when one speaks often of one's self." "I am above such people," said the proud blade; "I can find nothing more interesting to talk of than myself." As time went on, it was delighted to find that it grew taller than any other blade in the field, and threw out other blades; and at last there grew out of the top of its stalk ever so many plump, new little grains, all fitting closely together, and wearing tight little green covers. "Look at me!" it said then. "I am the queen of all the wheat. I have a crown." "No," said its learned companion. "You are now an ear of wheat." And in a short time all the other stalks wore the same kind of crown, and it found out that the learned blade was right, and that it was only an ear, after all. And now the weather had grown still warmer and the trees were covered with leaves, and the birds sang and built their nests in them and laid their little blue eggs, and in time, wonderful to relate, there came baby birds, that were always opening their mouths for food, and crying "peep, peep," to their fathers and mothers. There were more butterflies floating about on their amber and purple wings, and the gold and green beetles were so busy they had no time to talk. "Well!" said the proud ear of wheat (you remember it was an ear by this time) to its companion one day. "You see, you were right again. I am not so green as I was. I am turning yellow–but yellow is the colour of gold, and I don't object to looking like gold." "You will soon be ripe," said its friend. "And what will happen then?" "The reaping-machine will come and cut you down, and other strange things will happen." "There I make a stand," said the proud ear, "I will not be cut down." But it was just as the wise ear said it would be. Not long after, a reaping-machine was brought and driven back and forth in the field, and down went all the wheat ears before the great knives. But it did not hurt the wheat, of course, and only the proud ear felt angry. "I am the colour of gold," it said, "and yet they have dared to cut me down What will they do next, I wonder?" What they did next was to bunch it up with other wheat and tie it and stack it together, and then it was carried in a wagon and laid in the barn. Then there was a great bustle after a while. The farmer's wife and daughters and her two servants began to work as hard as they could. "The threshers are coming," they said, "and we must make plenty of things for them to eat." So they made pies and cakes and bread until their cupboards were full; and surely enough the threshers did come with the threshing-machine, which was painted red, and went "Puff! puff! puff! rattle! rattle!" all the time. And the proud wheat was threshed out by it, and found itself in grains again and very much out of breath. "I look almost as I was at first," it said; "only there are so many of me. I am grander than ever now. I was only one grain of wheat at first, and now I am at least fifty." When it was put into a sack, it managed to get all its grains together in one place, so that it might feel as grand as possible. It was so proud that it felt grand, however much it was knocked about. "Take this yere sack of wheat to the mill, Jerry. I want to try it when I make that thar cake for the boarders. Them two children from Washington city are powerful hands for cake." So Jerry lifted the sack up and threw it over his shoulder, and carried it out into the spring-waggon. "Now we are going to travel," said the proud wheat. Don't let us be separated." "Jerry, take us in the waggon! Let us go to mill, Jerry. We want to go to mill." And these were the very two boys who had played in the granary and made so much noise the summer before. They had grown a little bigger, and their yellow hair was longer, but they looked just as they used to, with their strong little legs and big brown eyes, and their sailor hats set so far back on their heads that it was a wonder they stayed on. And gracious how they shouted and ran. "What does yer mar say?" asked Jerry. "Says we can go! "shouted both at once, as if Jerry had been deaf, which he wasn't at all–quite the contrary. So Jerry, who was very good-natured, lifted them in, and cracked his whip, and the horses started off. It was a long ride to the mill, but Lionel and Vivian were not too tired to shout again when they reached it. They shouted at sight of the creek and the big wheel turning round and round slowly, with the water dashing and pouring and foaming over it. "What turns the wheel?" asked Vivian. "The water, honey," said Jerry. "Well now, honey," said Jerry, "you hev me thar. I don't know nuffin 'bout it. Lors-a-massy, what a boy you is fur axin dif'cult questions." Then he carried the sack in to the miller, and said he would wait until the wheat was ground. "Ground!" said the proud wheat. "We are going to be ground. I hope it is agreeable. Let us keep close together." They did keep close together, but it wasn't very agreeable to be poured into a hopper and then crushed into fine powder between two big stones. "Makes nice flour," said the miller, rubbing it between his fingers. "Flour!" said the wheat–which was wheat no longer. "Now I am flour, and I am finer than ever. How white I am! I really would rather be white than green or gold colour. I wonder where the learned grain is, and if it is as fine and white as I am?" But the learned grain and her family had been laid away in the granary for seed wheat. Before the waggon reached the house again, the two boys were fast asleep in the bottom of it, and had to be helped out just as the sack was, and carried in. The sack was taken into the kitchen at once and opened, and even in its wheat days the flour had never been so proud as it was when it heard the farmer's wife say–"I'm going to make this into cake." "Ah!" it said; "I thought so. Now I shall be rich, and admired by everybody." The farmer's wife then took some of it out in a large white bowl, and after that she busied herself beating eggs and sugar and butter all together in another bowl: and after a while she took the flour and beat it in also. "Now I am in grand company," said the flour. "The eggs and butter are the colour of gold, the sugar is like silver or diamonds. This is the very society for me." "The cake looks rich," said one of the daughters. "It's rather too rich for them children," said her mother. "But Lawsey, I dunno, neither. Nothin' don't hurt 'em. I reckon they could eat a panel of rail fence and come to no harm." "I'm rich," said the flour to itself. "That is just what I intended from the first. I am rich and I am cake." Just then, a pair of big brown eyes came and peeped into it. They belonged to a round little head with a mass of tangled curls all over it–they belonged to Vivian. "I like you," said Vivian, "You're such a nice woman. Who's going to eat any of it? Is Lionel?" "I'm afraid it's too rich for boys," said the woman, but she laughed and kissed him. "No," said Vivian. "I'm afraid it isn't." "I shall be much too rich," said the cake, angrily. "Boys indeed. I was made for something better than boys." After that, it was poured into a cake-mould, and put into the oven, where it had rather an unpleasant time of it. It was so hot in there that if the farmer's wife had not watched it carefully, it would have been burned. "But I am cake," it said, "and of the richest kind, so I can bear it, even if it is uncomfortable." When it was taken out, it really was cake, and it felt as if it was quite satisfied. Everyone who came into the kitchen and saw it, said–"Oh, what nice cake! How well your new flour has done!" But just once, while it was cooling, it had a curious, disagreeable feeling. It found, all at once, that the two boys, Lionel and Vivian, had come quietly into the kitchen and stood near the table, looking at the take with their great eyes wide open and their little red mouths open, too. "Dear me," it said. "How nervous I feel–actually nervous. What great eyes they have, and how they shine! and what are those sharp white things in their mouths? I really don't like them to look at me in that way. It seems like something personal. I wish the farmer's wife would come." Such a chill ran over it, that it was quite cool when the woman came in, and she put it away in the cupboard on a plate. But, that very afternoon, she took it out again and set it on the table on a glass cake-stand. She put some leaves around it to make it look nice, and it noticed that there were a great many other things on the table, and they all looked fresh and bright. "This is all, in my honour," it said. "They know I am rich." Then several people came in and took chairs around the table. "They all come in to sit and look at me," said the vain cake. "I wish the learned grain could see me now." There was a little high-chair on each side of the table, and at first these were empty, but in a few minutes the door opened and in came the two little boys. They had pretty, clean dresses on, and their "bangs" and curls were bright with being brushed. "Even they have been dressed up to do me honour," thought the cake. But, the next minute, it began to feel quite nervous again. Vivian's chair was near the glass stand, and when he had climbed up and seated himself, he put one elbow on the table and rested his fat chin on his fat hand, and, fixing his eyes on the cake, sat and stared at it in such an unnaturally quiet manner for some seconds, that any cake might well have felt nervous. "There's the cake," he said, at last, in such a deeply thoughtful voice that the cake felt faint with anger. Then a remarkable thing happened. Some one drew the stand toward them and took a knife and cut out a large slice of the cake. "Go away!" said the cake, though no one heard it. "I am cake! I am rich! I am not for boys! How dare you?" Vivian stretched out his hand; he took the slice; he lifted it up, and then the cake saw his red mouth open–yes, open wider than it could have believed possible–wide enough to show two dreadful rows of little sharp white things. But it never said "cious." Never at all For in two minutes Vivian had eaten it!! And there was an end of its airs and graces. IT began with Aunt Hetty's being out of temper, which, it must be confessed, was nothing new. At its best, Aunt Hetty's temper was none of the most charming, and this morning it was at its worst She had awakened to the consciousness of having a hard day's work before her, and she had awakened late, and so everything had gone wrong from the first. There was a sharp ring in her voice when she came to Jem's bedroom door and called out, "Jemima, get up this minute!" Jem knew what to expect when Aunt Hefty began a day by calling her "Jemima." It was one of the poor child's grievances that she had been given such an ugly name. In all the books she had read, and she had read a great many, Jem never had met a heroine who was called Jemima. But it had been her mother's favourite sister's name, and so it had fallen to her lot. Her mother always called her "Jem," or "Mimi," which was much prettier, and even Aunt Hetty only reserved Jemima for unpleasant state occasions. It was a dreadful day to Jem. Her mother was not at home, and would not be until night. She had been called away unexpectedly, and had been obliged to leave Jem and the baby to Aunt Hetty's mercies. So Jem found herself busy enough. Scarcely had she finished doing one thing, when Aunt Hetty told her to begin another. She wiped dishes and picked fruit and attended to the baby; and when baby had gone to sleep, and everything else seemed disposed of, for a time, at least, she was so tired that she was glad to sit down. And then she thought of the book she had been reading the night before–a certain delightful story book, about a little girl whose name was Flora, and who was so happy and rich and pretty and good that Jem had likened her to the little princesses one reads about, to whose christening feast every fairy brings a gift. "I shall have time to finish my chapter before dinner-time comes," said Jem, and she sat down snugly in one corner of the wide, old fashioned fireplace. But she had not read more than two pages before something dreadful happened. Aunt Hetty came into the room in a great hurry–such a hurry, indeed, that she caught her foot in the matting and fell, striking her elbow sharply against a chair, which so upset her temper that the moment she found herself on her feet she flew at Jem. "What," she said, snatching the book from her, "reading again, when I am running all over the house for you?" And she flung the pretty little blue covered volume into the fire. Jem sprang to rescue it with a cry, but it was impossible to reach it; it had fallen into a great hollow of red coal, and the blaze caught it at once. "You are a wicked woman!" cried Jem, in a dreadful passion, to Aunt Hetty. "You are a wicked woman." Then matters reached a climax. Aunt Hetty boxed her ears, pushed her back on her little footstool, and walked out of the room. Jem hid her face on her arms and cried as if her heart would break. She cried until her eyes were heavy, and she thought she should be obliged to go to sleep. But just as she was thinking of going to sleep, something fell down the chimney and made her look up. It was a piece of mortar, and it brought a good deal of soot with it. She bent forward and looked up to see where it had come from. The chimney was so very wide that this was easy enough. She could see where the mortar had fallen from the side and left a white patch. "How white it looks against the black," said Jem; "it is like a white brick among the black ones. What a queer place a chimney is! I can see a bit of the blue sky, I think." And then a funny thought came into her fanciful little head. What a many things were burned in the big fireplace and vanished in smoke or tinder up the chimney! Where did everything go? There was Flora, for instance–Flora who was represented on the frontispiece–with lovely, soft, flowing hair, and a little fringe on her pretty round forehead, crowned with a circlet of daisies, and a laugh in her wide-awake round eyes. Where was she by this time? Certainly there was nothing left of her in the fire. Jem almost began to cry again at the thought. "It was too bad," she said. "She was so pretty and funny, and I did like her so." I daresay it scarcely will be credited by unbelieving people when I tell them what happened next, it was such a very singular thing, indeed. Jem felt herself gradually lifted off her little footstool. "Oh!" she said, timidly, "I feel very light." She did feel light, indeed. She felt so light that she was sure she was rising gently in the air. "Oh," she said again, "how–how very light I feel! Oh, dear, I'm going up the chimney!" It was rather strange that she never thought of calling for help, but she did not. She was not easily frightened; and now she was only wonderfully astonished, as she remembered afterwards. She shut her eyes tight and gave a little gasp. "I've heard Aunt Hetty talk about the draught drawing things up the chimney, but I never knew it was as strong as this," she said. She went up, up, up, quietly and steadily, and without any uncomfortable feeling at all; and then all at once she stopped, feeling that her feet rested against something solid. She opened her eyes and looked about her, and there she was, standing right opposite the white brick, her feet on a tiny ledge. "Well," she said, "this is funny." But the next thing that happened was funnier still. She found that, without thinking what she was doing, she was knocking on the white brick with her knuckles, as if it was a door and she expected somebody to open it. The next minute she heard footsteps, and then a sound, as if someone was drawing back a little bolt. "It is a door," said Jem, "and somebody is going to open it." The white brick moved a little, and some more mortar and soot fell; then the brick moved a little more, and then it slid aside and left an open space. "It's a room!" cried Jem. "There's a room behind it!" And so there was, and before the open space stood a pretty little girl, with long lovely hair and a fringe on her forehead. Jem clasped her hands in amazement. It was Flora herself, as she looked in the picture, and Flora stood laughing and nodding. "Come in," she said. "I thought it was you." "But how can I come in through such a little place?" asked Jem. "Oh, that is easy enough," said Flora. "Here, give me your hand." Jem did as she told her, and found that it was easy enough. In an instant she had passed through the opening, the white brick had gone back to its place, and she was standing by Flora's side in a large room–the nicest room she had ever seen. It was big and lofty and light, and there were all kinds of delightful things in it–books and flowers and playthings and pictures, and in one corner a great cage full of lovebirds. "Have I ever seen it before?" asked Jem, glancing slowly round. "Yes," said Flora; "you saw it last night–in your mind. Don't you remember it?" "I feel as if I did, but–"
"Why," said Flora, laughing, "it's my room, the one you read about last night." "So it is," said Jem. "But how did you come here?" "I can't tell you that; I myself don't know. But I am here, and so"–rather mysteriously–"are a great many other things." "Are they?" said Jem, very much interested. "What things? Burned things? I was just wondering–"
"Not only burned things," said Flora, nodding. "Just come with me and I'll show you something." She led the way out of the room and down a little passage with several doors in each side of it, and she opened one door and showed Jem what was on the other side of it. That was a room, too, and this time it was funny as well as pretty. Both floor and walls were padded with rose colour, and the floor was strewn with toys. There were big soft balls, rattles, horses, woolly dogs, and a doll or so; there was one low cushioned chair and a low table. "You can come in," said a shrill little voice behind the door, "only mind you don't tread on things." "What a funny little voice!" said Jem, but she had no sooner said it than she jumped back. The owner of the voice, who had just come forward, was no other than Baby. "Why," exclaimed Jem, beginning to feel frightened." I left you fast asleep in your crib." "Did you?" said Baby, somewhat scornfully. "That's just the way with you grown-up people. You think you know everything, and yet you haven't discretion enough to know when a pin is sticking into one. You'd know soon enough if you had one sticking into your own back." "But I'm not grown up," stammered Jem; "and when you are at home you can neither walk nor talk. You're not six months' old." "Well, miss," retorted Baby, whose wrongs seemed to have soured her disposition somewhat, "you have no need to throw that in my teeth; you were not six months old, either, when you were my age." Jem could not help laughing. "You haven't got any teeth," she said. "Haven't I?" said Baby, and she displayed two beautiful rows with some haughtiness of manner. "When I am up here," she said, "I am supplied with the modern conveniences, and that's why I never complain. Do I ever cry when I am asleep? It's not falling asleep I object to, it's falling awake." "Wait a minute," said Jem. "Are you asleep now?" "I'm what you call asleep. I can only come here when I'm what you call asleep. Asleep, indeed! It's no wonder we always cry when we have to fall awake." "But we don't mean to be unkind to you," protested Jem, meekly. She could not help thinking baby was very severe. "Don't mean!" said Baby. "Well, why don't you think more, then? How would you like to have all the nice things snatched away from you, and all the old rubbish packed off on you, as if you hadn't any sense? How would you like to have to sit and stare at things you wanted, and not to be able to reach them, or, if you did reach them, have them fall out of your hand, and roll away in the most unfeeling manner? And then be scolded and called 'cross!' It's no wonder we are bald. You'd be bald yourself. It's trouble and worry that keep us bald until we can begin to take care of ourselves; I had more hair than this at first, but it fell off, as well it might. No philosopher ever thought of that, I suppose!" "Well," said Jem, in despair, "I hope you enjoy yourself when you are here?" "Yes, I do," answered Baby. "That's one comfort. There is nothing to knock my head against, and things have patent stoppers on them, so that they can't roll away, and everything is soft and easy to pick up." There was a slight pause after this, and Baby seemed to cool down. "I suppose you would like me to show you round?" she said. "Not if you have any objection," replied Jem, who was rather subdued. "I would as soon do it as not," said Baby. "You are not as bad as some people, though you do get my clothes twisted when you hold me." Upon the whole, she seemed rather proud of her position. It was evident she quite regarded herself as hostess. She held her small bald head very high indeed, as she trotted on before them. She stopped at the first door she came to, and knocked three times. She was obliged to stand upon tiptoe to reach the knocker. "He's sure to be at home at this time of year," she remarked. "This is the busy season." But Flora only laughed at Miss Baby's consequential air. "S. C., to be sure," was the answer, as the young lady pointed to the door-plate, upon which Jem noticed, for the first time, "S. C." in very large letters. The door opened, apparently without assistance, and they entered the apartment. "Good gracious!" exclaimed Jem, the next minute "Goodness gracious!" She might well be astonished. It was such a long room that she could not see to the end of it, and it was piled up from floor to ceiling with toys of every description, and there was such bustle and buzzing in it that it was quite confusing. The bustle and buzzing arose from a very curious cause, too,–it was the bustle and buzz of hundreds of tiny men and women who were working at little tables no higher than mushrooms,–the pretty tiny women cutting out and sewing, the pretty tiny men sawing and hammering, and all talking at once. The principal person in the place escaped Jem's notice at first; but it was not long before she saw him,–a little old gentleman, with a rosy face and sparkling eyes, sitting at a desk, and writing in a book almost as big. as himself. He was so busy that he was quite excited, and had been obliged to throw his white fur coat and cap aside, and he was at work in his red waistcoat. "Look here, if you please," piped Baby. "I have brought someone to see you." When he turned round, Jem recognized him at once. "Eh! Eh!" he said. "What What! Who's this, Tootsicums?" Baby's manner became very acid indeed. "I shouldn't have thought you would have said that, Mr. Claus," she remarked. "I can't help myself down below, but I generally have my rights respected up here. I should like to know what sane godfather or godmother would give one the name of 'Tootsicums' in one's baptism. They are bad enough, I must say; but I never heard of any of them calling a person 'Tootsicums.'" "Come, come!" said S. C., chuckling comfortably and rubbing his hands. "Don't be too dignified,–it's a bad thing. And don't be too fond of flourishing your rights in people's faces,–that's the worst of all, Miss Midget. Folks who make such a fuss about their rights turn them into wrongs sometimes." Then he turned suddenly to Jem. "You are the little girl from down below," he said. "Yes, sir," answered Jem. "I'm Jem, and this is my friend Flora,–out of the blue book." "I'm happy to make her acquaintance," said S. 0., "and I'm happy to make yours. You are a nice child, though a trifle peppery. I'm very glad to see you." "I'm very glad indeed to see you, sir," said Jem. I wasn't quite sure–"
But there she stopped, feeling that it would be scarcely polite to tell him that she had begun of late years to lose faith in him. But S. C. only chuckled more comfortably than ever and rubbed his hands again. "Ho, ho!" he said. "You know who I am, then?" Jem hesitated a moment, wondering whether it would not be taking a liberty to mention his name without putting "Mr." before it; then she remembered what Baby had called him. "Baby called you 'Mr. Claus,' sir," she replied; "and I have seen pictures of you." "To be sure," said S. C. "S. Claus, Esquire, of Chimney-land. How do you like me?" "Very much," answered Jem; "very much, indeed, sir." "Glad of it! Glad of it! But what was it you were going to say you were not quite sure of?" "I was not quite sure that–that you were true, sir. At least I have not been quite sure since I have been older." S. C, rubbed the bald part of his head and gave a little sigh. "I hope I have not hurt your feelings, sir," faltered Jem, who was a very kind hearted little soul. "Well, no," said S. C. "Not exactly. And it is not your fault either. It is natural, I suppose; at any rate, it is the way of the world. People lose their belief in a great many things as they grow older; but that does not make the things not true, thank goodness! and their faith often comes back after a while. But, bless me!" he added, briskly, "I'm moralizing, and who thanks a man for doing that? Suppose–"
"Black eyes or blue, sir?" said a tiny voice close to them. Jem and Flora turned round, and saw it was one of the small workers who was asking the question. "Whom for?" inquired S. C.
"Little girl in the red brick house at the corner," said the workwoman; "name of Birdie." "Excuse me a moment," said S. C. to the children, and he turned to the big book and began to run his fingers down the pages in a business-like manner. "Ah! here she is!" he exclaimed at last. "Blue eyes, if you please, Thistle, and golden hair. And let it be a big one. She takes good care of them." "Yes, sir," said Thistle; "I am personally acquainted with several dolls in her family. I go to parties in her dolls' house sometimes when she is fast asleep at night, and they all speak very highly of her. She is most attentive to them when they are ill. In fact, her pet doll is a cripple, with a stiff leg." She ran back to her work and S. C. finished his sentence. "Suppose I show you my establishment," he said. "Come with me." It really would be quite impossible to describe the wonderful things he showed them. Jem's head was quite in a whirl before she had seen one-half of them, and even Baby condescended to become excited. "There must be a great many children in the world, Mr. Claus," ventured Jem. "Yes, yes, millions of 'em; bless 'em," said S. C., growing rosier with delight at the very thought. "We never run out of them, that's one comfort. There's a large and varied assortment always on hand. Fresh ones every year, too, so that when one grows too old there is a new one ready. I have a place like this in every twelfth chimney. Now it's boys, now it's girls, always one or t'other: and there's no end of playthings for them, too, I'm glad to say. For girls, the great thing seems to be dolls. Blitzen! what comfort they do take in dolls! but the boys are for horses and racket." They were standing near a table where a worker was just putting the finishing touch to the dress of a large wax doll, and just at that moment, to Jem's surprise, she set it on the floor, upon its feet, quite coolly. "Thank you," said the doll, politely. "You can join the rest now and introduce yourself," said the worker. The doll looked over her shoulder at her train. "It hangs very nicely," she said. "I hope it's the latest fashion." "Mine never talked like that," said Flora. "My best one could only say 'Mamma,' and it said it very badly, too." "She was foolish for saying it at all," remarked the doll, haughtily. "We don't talk and walk before ordinary people; we keep our accomplishments for our own amusement, and for the amusement of our friends. If you should chance to get up in the middle of the night, some time, or should run into the room suddenly some day, after you have left it, you might hear–but what is the use of talking to human beings?" "You know a great deal, considering you are only just finished," snapped Baby, who really was a Tartar. "I was FINISHED," retorted the doll. "I did not begin life as a baby!" very scornfully. "Pooh!" said Baby. "We improve as we get older." "I hope, so, indeed," answered the doll "There is plenty of room for improvement." And she walked away in great state. S. C. looked at Baby and then shook his head. "I shall not have to take very much care of you," he said, absentmindedly. "You are able to take pretty good care of yourself." "I hope I am," said Baby, tossing her head. S. C. gave his head another shake. "Don't take too good care of yourself," he said. "That's a bad thing, too." He showed them the rest of his wonders, and then went with them to the door to bid them good-bye. "I am sure we are very much obliged to you, Mr. Claus," said Jem, gratefully. "I shall never again think you are not true, sir." S. C. patted her shoulder quite affectionately. "That's right," he said. "Believe in things just as long as you can, my dear. Good-bye until Christmas Eve. I shall see you then, if you don't see me." He must have taken quite a fancy to Jem, for he stood looking at her, and seemed very reluctant to close the door, and even after he had closed it, and they had turned away, he opened it a little again to call to her. "Believe in things as long as you can, my dear." "How kind he is!" exclaimed Jem, full of pleasure. "Well enough in his way," she said, "but rather inclined to prose and be old-fashioned." Jem looked at her, feeling rather frightened, but she said nothing. Baby showed very little interest in the next room she took them to. "I don't care about this place," she said, as she threw open the door. "It has nothing but old things in it. It is the Nobody-knows-where room." She had scarcely finished speaking before Jem made a little spring and picked something up. "Here's my old strawberry pincushion!" she cried out. And then, with another jump and another dash at two or three other things, "And here's my old fairy-book! And here's my little locket I lost last summer! How did they come here?" "They went Nobody-knows-where," said Baby. "But cannot I have them again?" asked Jem. "No," answered Baby. "Things that go to Nobody-knows where stay there." "Oh!" sighed Jem, "I am so sorry." "They are only old things," said Baby. "But I like my old things," said Jem. "I love them. And there is mother's needle case. I wish I might take that. Her dead little sister gave it to her, and she was so sorry when she lost it." "People ought to take better care of their things," remarked Baby. Jem would have liked to stay in this room and wander about among her old favourites for a long time, but Baby was in a hurry. "You'd better come away," she said. "Suppose I was to have to fall awake and leave you?" The next place they went into was the most wonderful of all. "This is the Wish room," said Baby. "Your wishes come here–yours and mother's, and Aunt Hetty's and father's and mine. When did you wish that?" Each article was placed under a glass shade, and labelled with the words and name of the wishers. Some of them were beautiful, indeed; but the tall shade Baby nodded at when she asked her question was truly alarming, and caused Jem a dreadful pang of remorse. Underneath it sat Aunt Hetty, with her mouth stitched up so that she could not speak a word, and beneath the stand was a label bearing these words, in large black letters–"I wish Aunt Hetty's mouth was sewed up. Jem." "Oh, dear!" cried Jem, in great distress. "How it must have hurt her! How unkind of me to say it! I wish I hadn't wished it. I wish it would come undone." She had no sooner said it than her wish was gratified. The old label disappeared and a new one showed itself, and there sat Aunt Hetty, looking herself again, and even smiling. Jem was grateful beyond measure, but Baby seemed to consider her weak minded. "It served her right," she said. But when, after looking at the wishes at that end of the room, they went to the other end, her turn came. In one corner stood a shade with a baby under it, and the baby was Miss Baby herself, but looking as she very rarely looked; in fact, it was the brightest, best tempered baby one could imagine." "I wish I had a better tempered baby. Mother," was written on the label. Baby became quite red in the face with anger and confusion, "That wasn't here the last time I came," she said. "And it is right down mean in mother:"
This was more than Jem could bear. "It wasn't mean," she said. "She couldn't help it. You know you are a cross baby–everybody says so." Baby turned two shades redder. "Mind your own business," she retorted. "It was mean; and as to that silly little thing being better than I am," turning up her small nose, which was quite turned up enough by Nature–"I must say I don't see anything so very grand about her. So, there "
She scarcely condescended to speak to them while they remained in the Wish room, and when they left it, and went to the last door in the passage, she quite scowled at it. "I don't know whether I shall open it at all," she said. "Why not?" asked Flora. "You might as well." "It is the Lost pin room," she said. "I hate pins." She threw the door open with a bang, and then stood and shook her little fist viciously. The room was full of pins, stacked solidly together. There were hundreds of them–thousands–millions, it seemed. "I'm glad they are lost!" she said. "I wish there were more of them there." "I didn't know there were so many pins in the world," said Jem. "Pooh!" said Baby. "Those are only the lost ones that have belonged to our family." After this they went back into Flora's room and sat down, while Flora told Jem the rest of her story. "Oh!" sighed Jem, when she came to the end. "How delightful it is to be here! Can I never come again?" "In one way you can," said Flora. "When you want to come, just sit down and be as quiet as possible, and shut your eyes and think very hard about it. You can see everything you have seen to-day, if you try." "Then I shall be sure to try," Jem answered. She was going to ask some other question, but Baby stopped her. "Oh! I'm falling awake," she whimpered, crossly, rubbing her eyes. "I'm falling awake again." And then, suddenly, a very strange feeling came over Jem. Flora and the pretty room seemed to fade away, and, without being able to account for it at all, she found herself sitting on her little stool again, with a beautiful scarlet and gold book on her knee, and her mother standing by laughing at her amazed face. As to Miss Baby, she was crying as hard as she could in her crib. "Mother!" Jem cried out, "have you really come home so early as this, and–and," rubbing her eyes in great amazement, "how did I come down?" "Don't I look as if I was real?" said her mother, laughing and kissing her. "And doesn't your present look real? I don't know how you came down, I'm sure. Where have you been?" Jem shook her head very mysteriously. She saw that her mother fancied she had been asleep, but she herself knew better.